The other day, I was reading the news when a photo stole my attention. It was the image of a geisha standing on a red bridge and holding a paper umbrella. I immediately knew the picture was taken in Kyoto. In fact, the article stated that Kyoto was recently crowned the most beautiful city in the world by Travel+Leisure Magazine. Well, I couldn’t agree more. In my life, I have visited my share of countries and cities and Kyoto is by far my favourite place on earth. 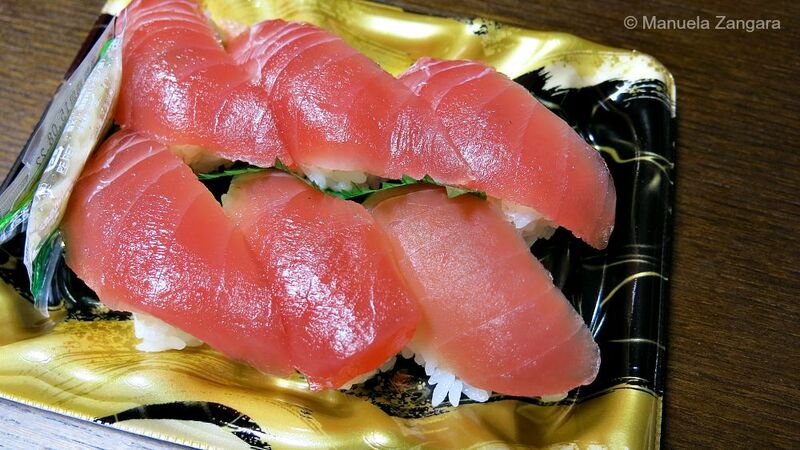 It’s a real gem… it’s all you expect to experience in Japan and more. It’s architecture, history, traditions, food, modernity, fun, shopping… And all of that in a city that is not humongous, so it’s easy to enjoy even on foot. If I had to choose only one place to see in Japan, it would be Kyoto, hands down. To tell you the truth, I miss it so much that I dreaded the time I would have to write my Kyoto guide, as it is making me feel very nostalgic. But at the same time, I am happy to remember the good times we had. We arrived in Kyoto from Koyasan. The journey took longer than we had anticipated as we took a local train from Gokurakubashi to Osaka (and then another train from Osaka to Kyoto). 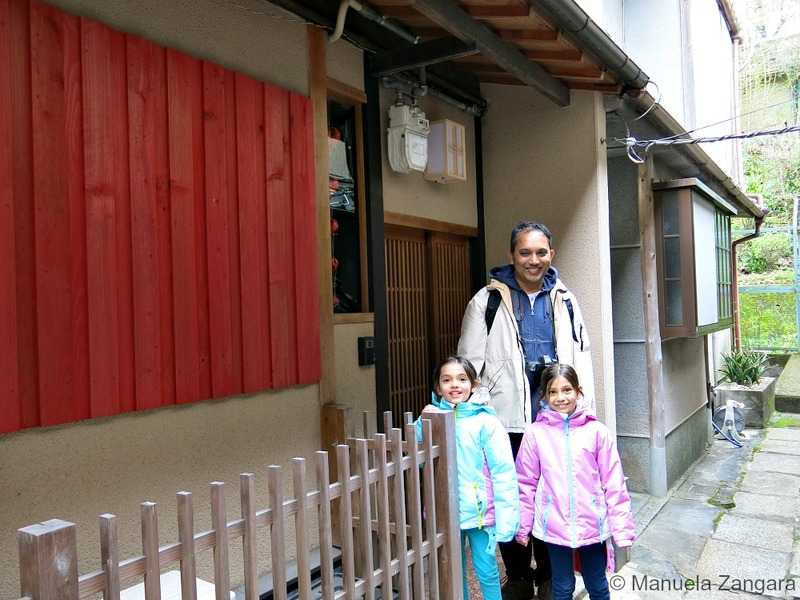 As we stayed in Kyoto for 6 nights, we rented a little town house, just for the 4 of us. We thought it would be nice to have a place to call our own for a few days and give the girls a little break from hotel rooms and more space to unwind. 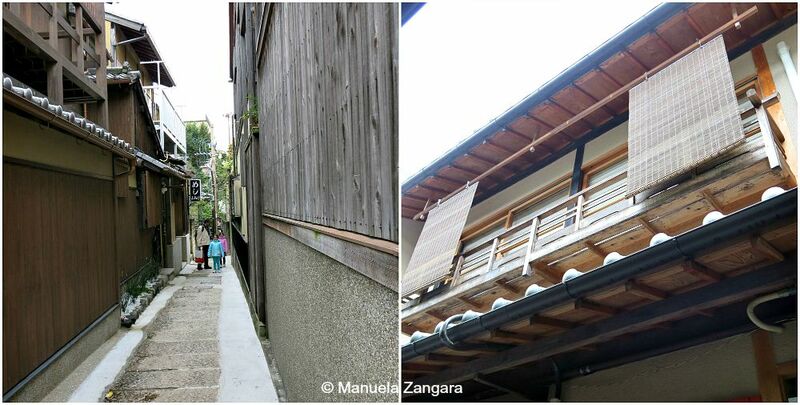 You can find many of these old restored houses in Kyoto. 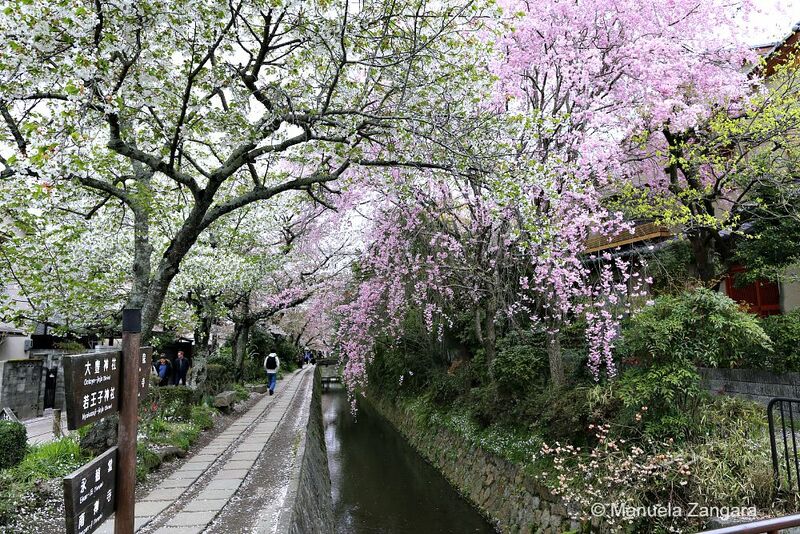 They are called machiya and they are often strategically located for sightseeing. We found “ours” on the internet and immediately fell in love with it. 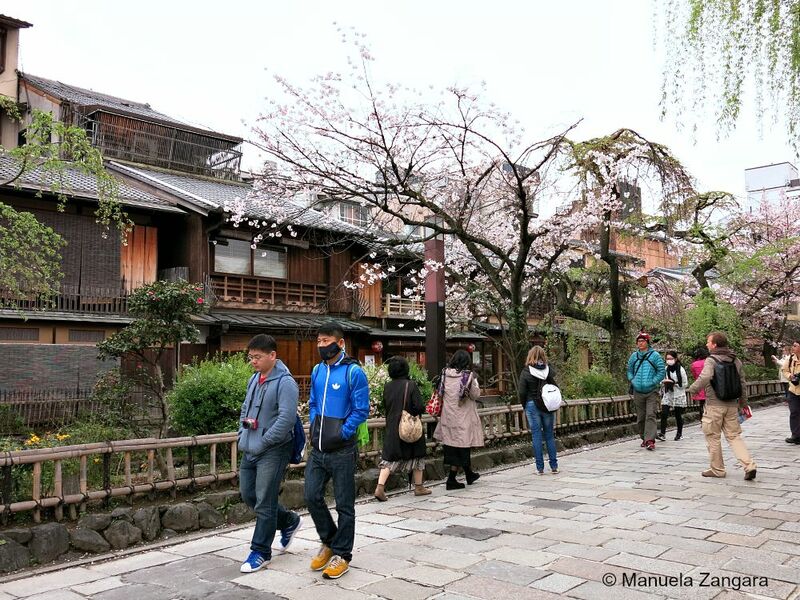 It’s called Kiyomizu Machiya Inn and it’s right off Ninenzaka, in Higashiyama. But I will tell you all about our lovely home later on. 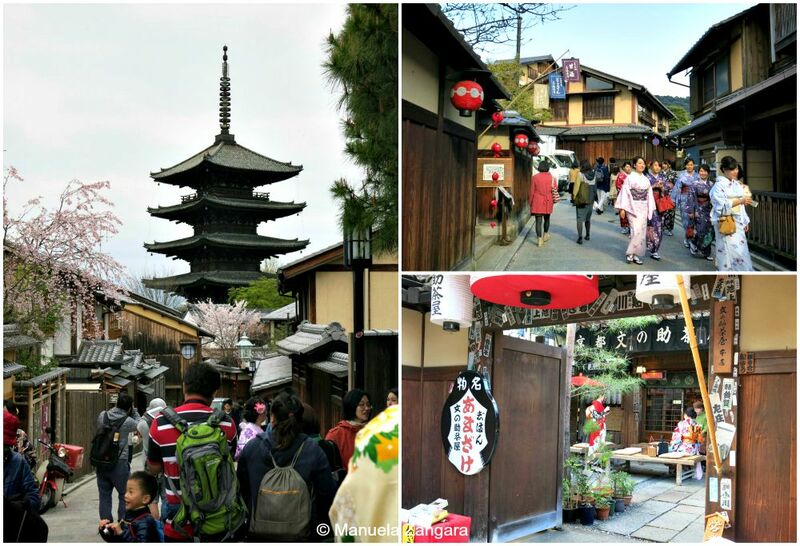 You could easily spend a whole month in Kyoto and still leave with plenty of things to see. 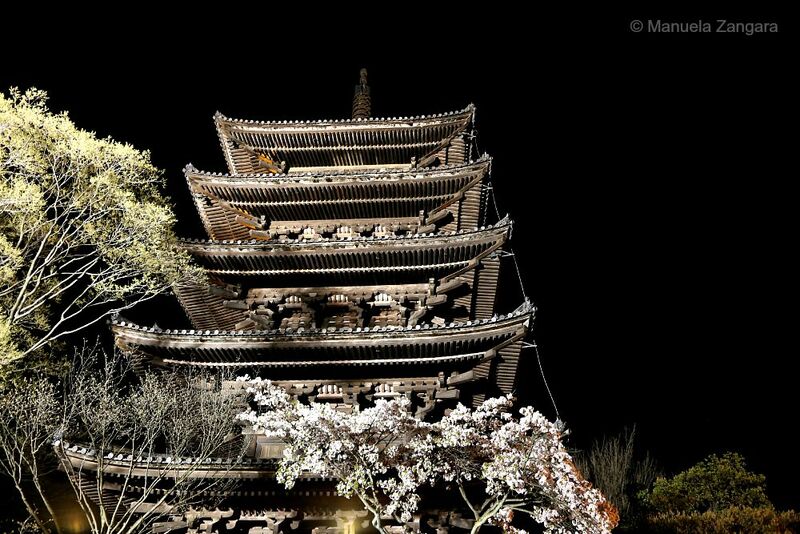 Kyoto is filled with amazing temples and attractions. One piece of advice, try and get to the most popular sites at opening times… or they could be way too crowded for you to really enjoy them. We started off by visiting the Sanjusangendo temple, famous for its 1001 statues of Kannon, the goddess of mercy. Then we moved on to Nishi Honganji temple. The girls also had the time to make their own bracelets here. 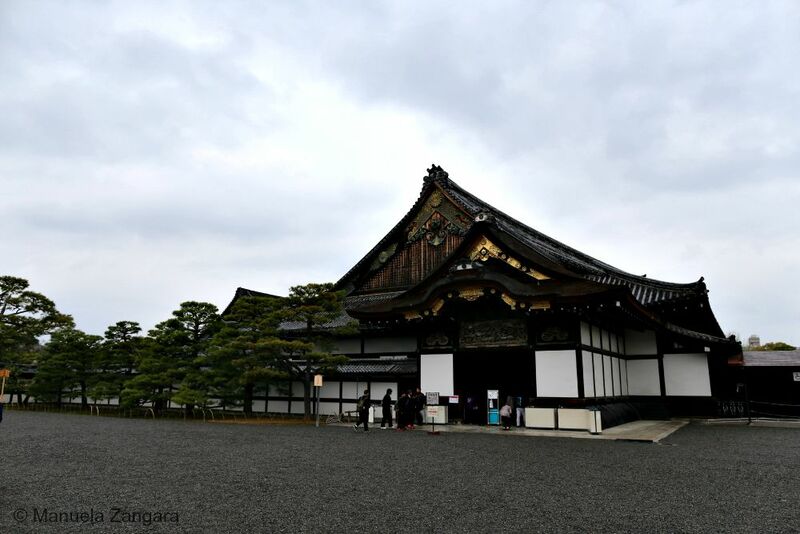 Nijo Castle was the Kyoto residence of Tokugawa Ieyasu, the first shogun of the Edo Period. Afterwards, Nijo Castle was used as an imperial palace for a while before being donated to the city and opened up to the public as a historic site. The castle was designated a UNESCO world heritage site in 1994. The entire castle grounds are surrounded by stone walls and moats. 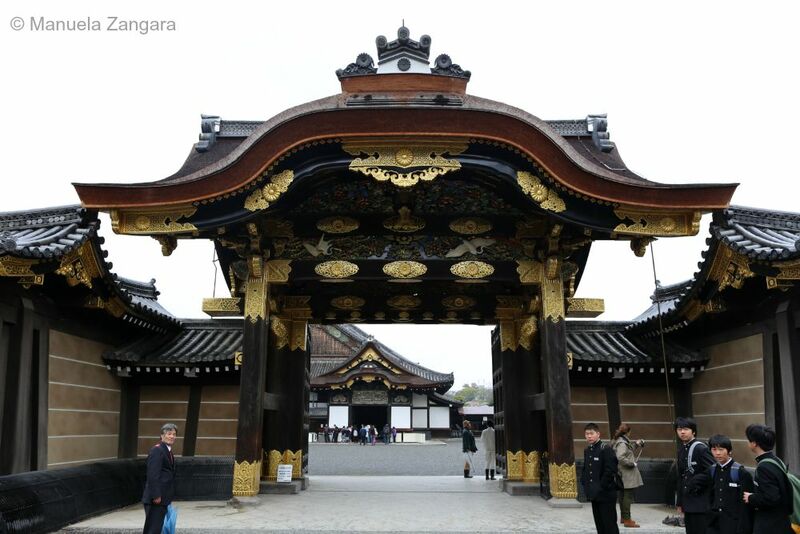 You enter the Nijo Castle grounds through a large gate. Venturing further into the castle will bring you to the Chinese style Karamon Gate. This is the entrance to the Ninomaru (secondary circle of defense), where the castle’s main attraction, the Ninomaru Palace is located. 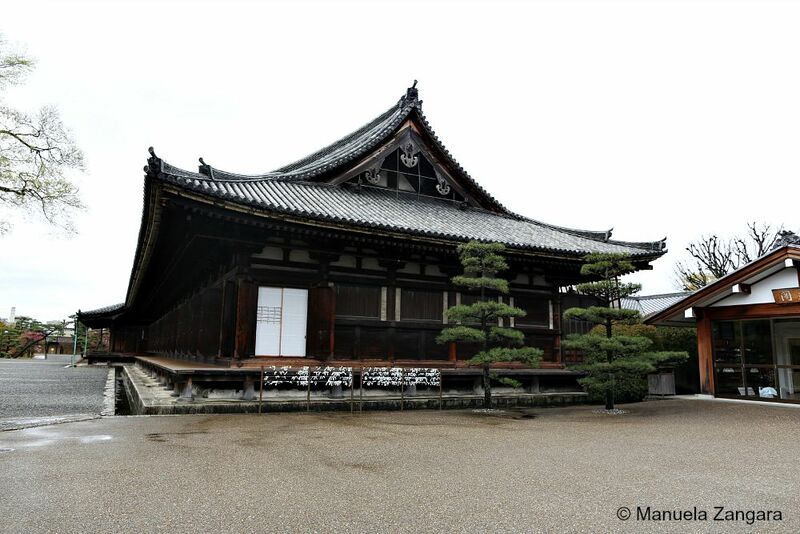 The Ninomaru Palace was the residence and office of the shogun during his visits to Kyoto. The main attraction of the inside of the palace is its floor! In fact, the various buildings are connected with each other by corridors with so called nightingale floors: they literally squeak when stepped upon as a security measure against intruders. 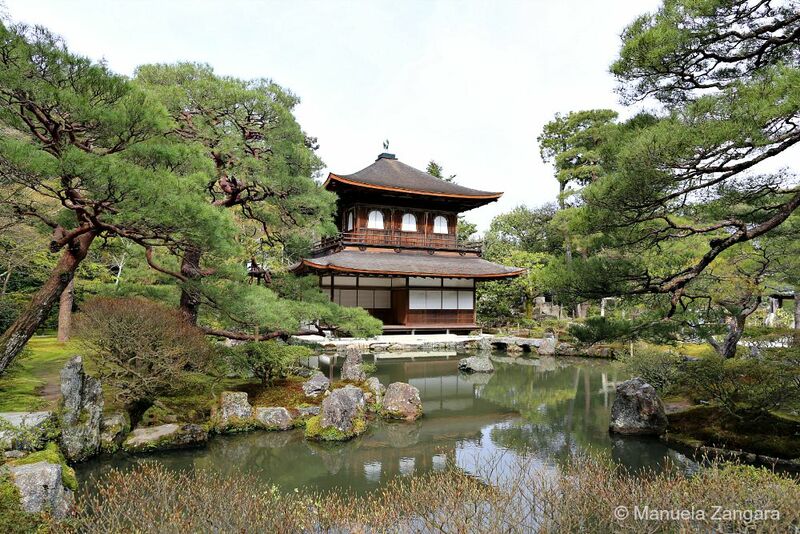 Outside of the Ninomaru Palace there is the Ninomaru Garden, a traditional Japanese landscape garden with a large pond, ornamental stones and manicured pine trees. Cherry trees of numerous varieties are planted throughout the castle grounds. Because of the many varieties present, the blooming season at Nijo Castle usually lasts from late March through the entire month of April. We didn’t roam around the garden too much as it was pouring that day! The Kyoto Imperial Palace used to be the residence of Japan’s Imperial Family until the capital was moved from Kyoto to Tokyo. It is located in the huge Kyoto Imperial Park. The complex is enclosed by long walls and consists of several gates, halls and gardens. The palace grounds can be entered only on guided tours (in English or Japanese) held by the Imperial Household Agency. Tours take about one hour and lead past the buildings and gardens, but none of the buildings can be entered. Advance reservations (see here for details) are compulsory and can be made online or at the Imperial Agency Office, within the Kyoto Imperial Park. Note though that kids are not allowed to enter some of the areas, so we did not bother. The Imperial Palace Park is beautiful and there are some impressive weeping cherry trees beside Konoe Pond in the park’s north-western corner. The Kyoto Station building is amazing. It is so modern that it stands in perfect contrast to many foreign tourists’ image of Kyoto as the capital of traditional Japan. Kyoto Station is the city’s transportation hub (served also by Japan Railways). It is also the site of a large bus terminal for city buses and long distance and overnight highway buses. The part we liked the most was the open air observation deck that you reach through a long series of escalators and a final flight of stairs. There are also many hotels, restaurants and shops in and around the station. 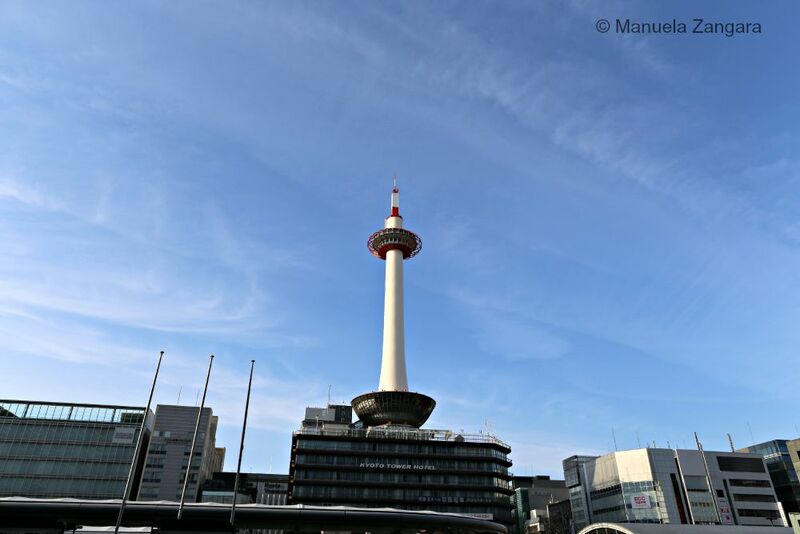 Just across the station, stands the Kyoto Tower – Kyoto’s tallest building and a rare modern landmark. A viewing platform is located 100 meters above ground and affords a 360 degree view of Kyoto and as far as Osaka on clear days. Probably the most famous temple in Kyoto is the massive Kiyomizu-dera (literally “Pure Water Temple”). It was built on the site of the Otowa Waterfall in the wooded hills east of Kyoto. 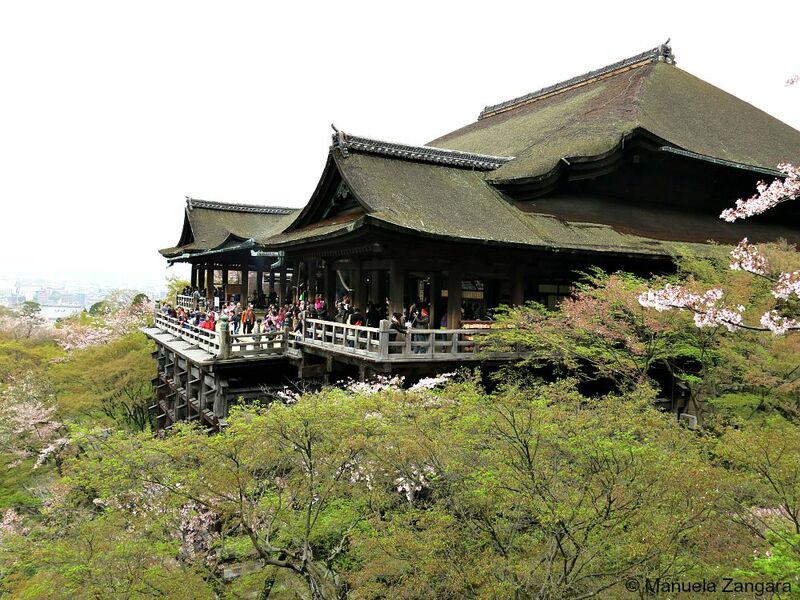 Kiyomizu-dera is known for the wooden stage that juts out from its main hall, 13 meters above the hillside below. 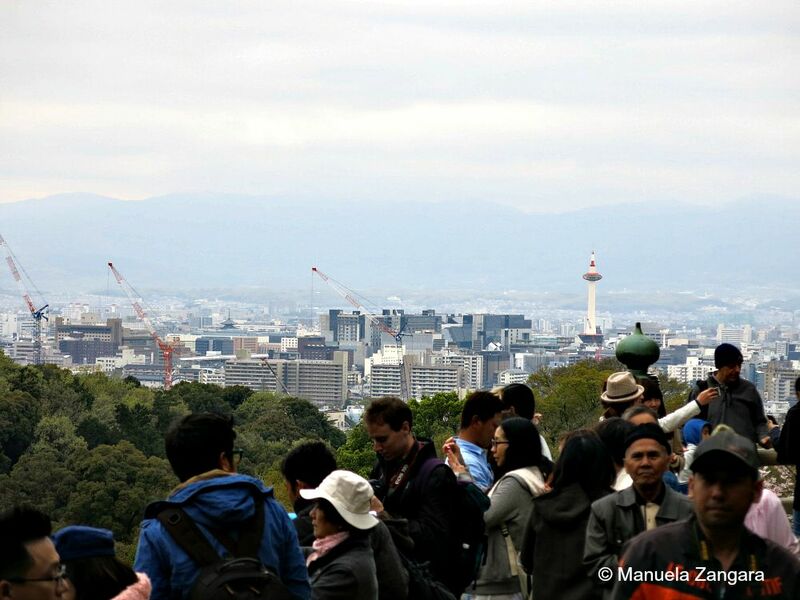 From there, you can see the numerous cherry and maple trees below, as well as the city of Kyoto. Some parts of the complex were undergoing renovations, but the place was still magic… even in gloomy weather. The Otowa Waterfall is below Kiyomizu-dera’s main hall. 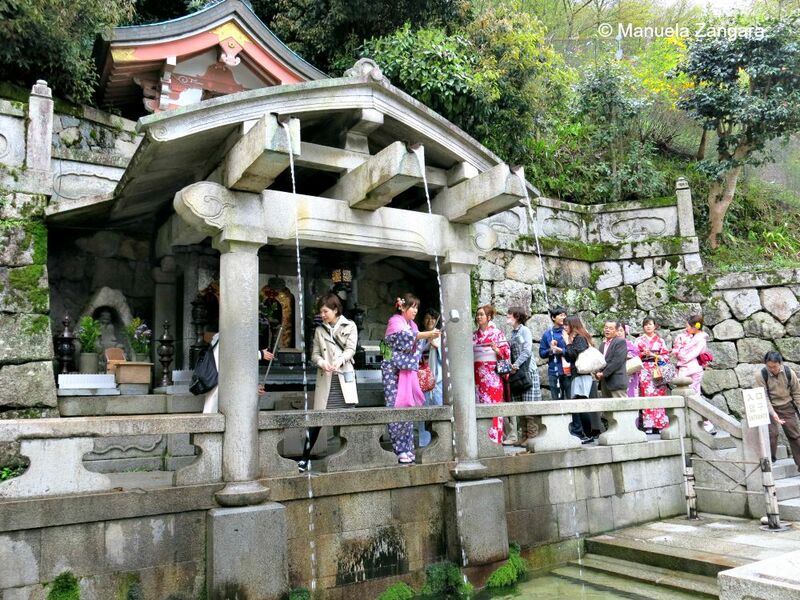 Its waters are divided into three separate streams and visitors can drink from them. Each stream’s water is said to have a different benefit, namely to cause longevity, success at school and a fortunate love life. 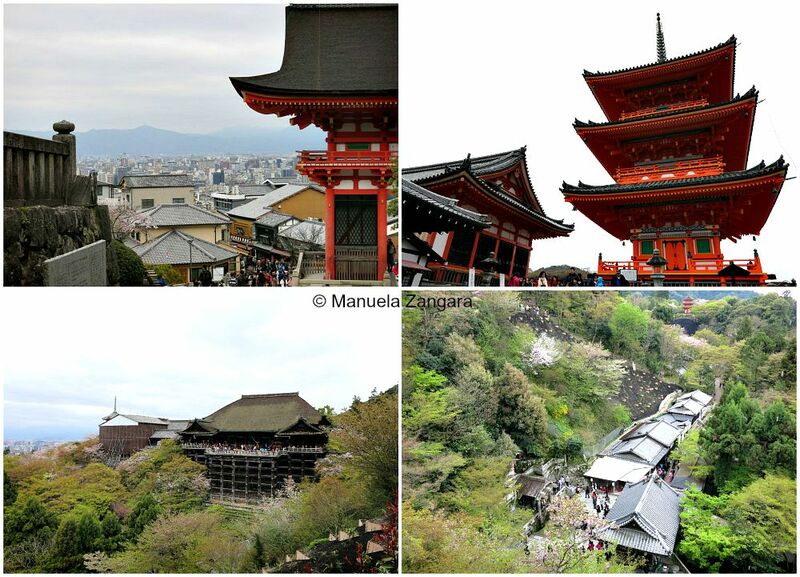 Getting to Kiyomizudera through Gojozaka and Chawanzaka is a great idea. 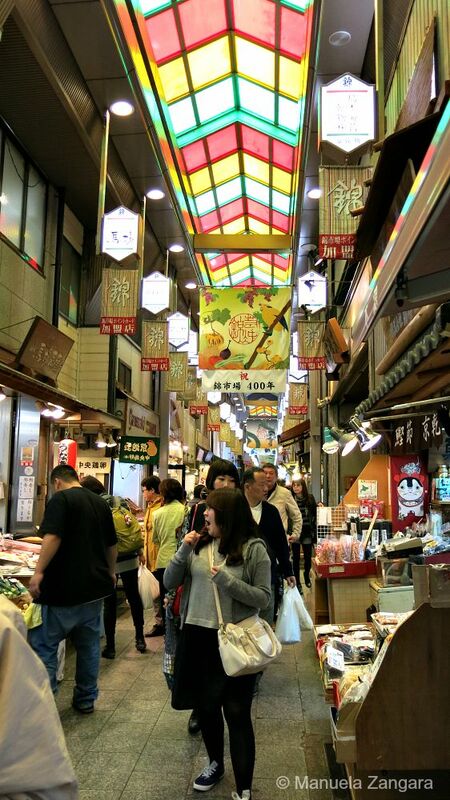 The many shops and restaurants in the area have been catering to tourists and pilgrims for centuries and you can easily find great pottery, sweets, pickles and fans to take home. 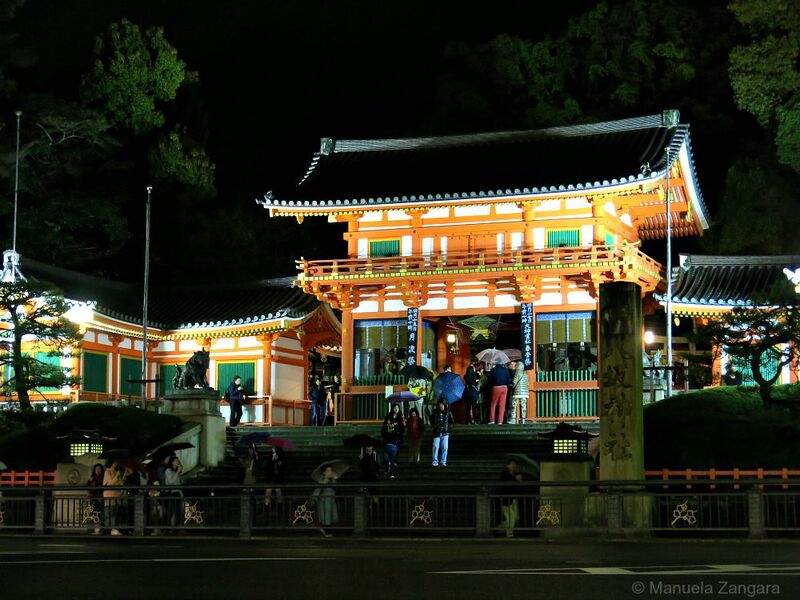 Yasaka Shrine is one of the most famous shrines in Kyoto and possibly my favourite. Yasaka Shrine is well known for its summer festival, the Gion Matsuri, which is celebrated every July. I love it especially at night, when it’s all lit up and the smell of the street food cooking in the stalls is amazing! The shrine also becomes busy during the cherry blossom season around early April, as the adjacent Maruyama Park is one of the most famous cherry blossom spots in Kyoto. 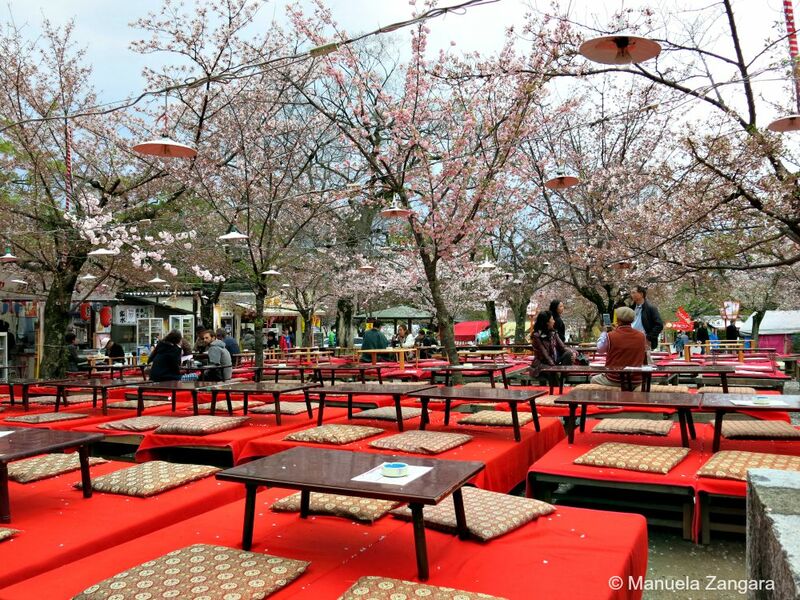 Maruyama Park is a public park next to Yasaka Shrine and Kyoto’s most popular and most crowded spot for cherry blossom viewing parties (hanami). 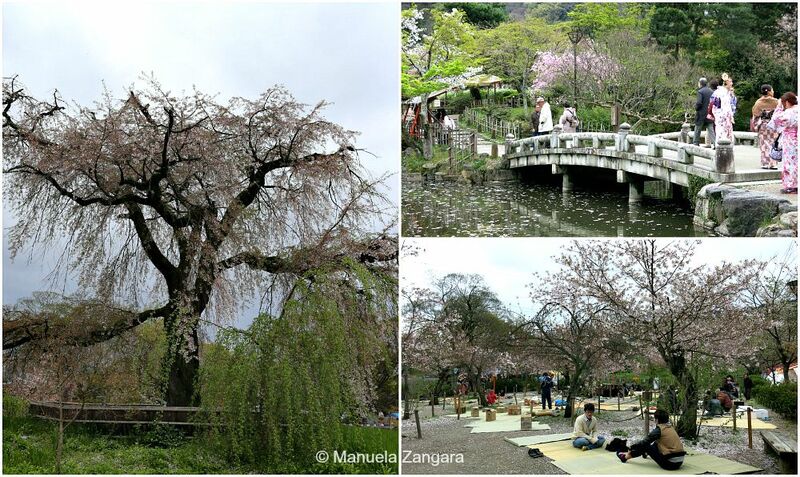 The centerpiece of the park is a tall shidarezakura (weeping cherry tree), which gets lit up at night. 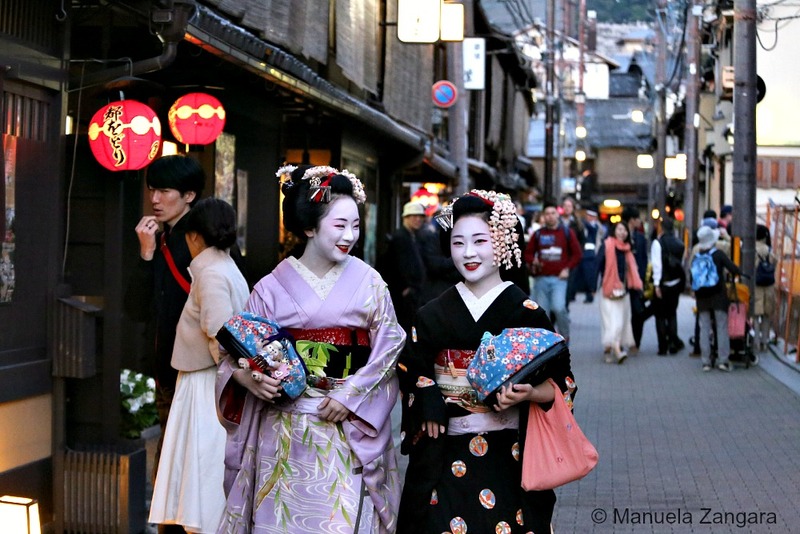 We loved strolling around Gion, Kyoto’s most famous geisha district. It is located around Shijo dori between Yasaka Shrine and the Kamo River. 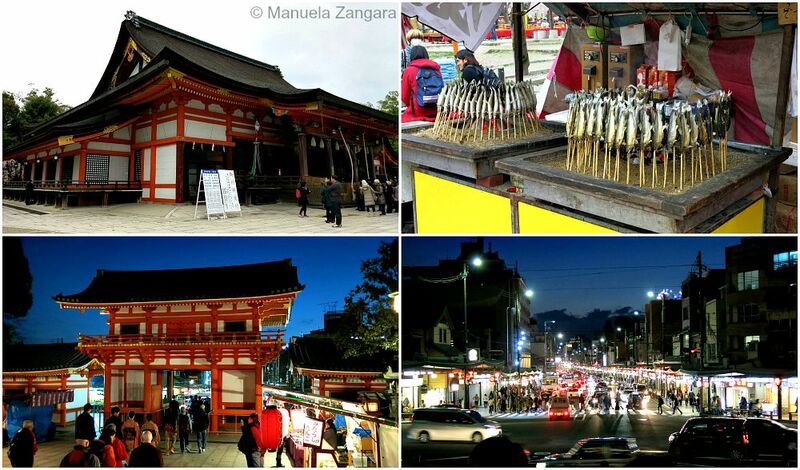 It is filled with shops, restaurants and tea houses, where geisha and maiko entertain. 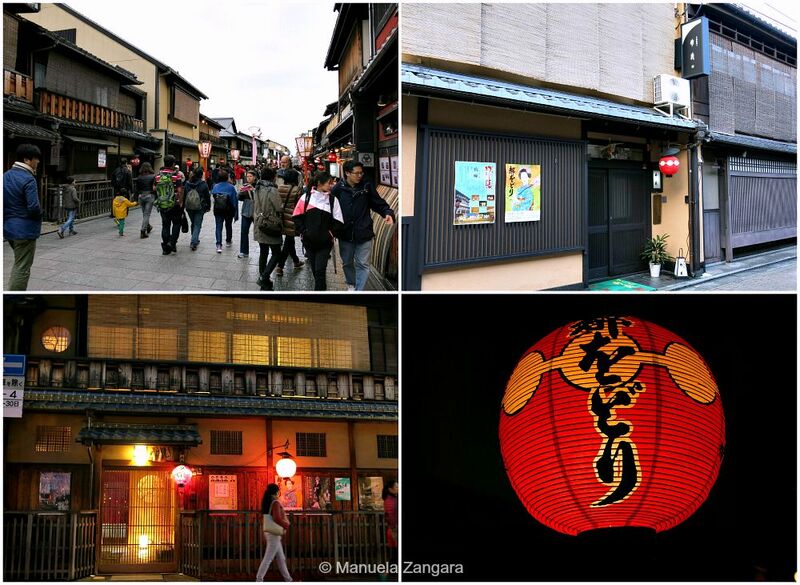 The most popular area of Gion is Hanamikoji-dori (between Shijo-dori and Kenninji Temple). 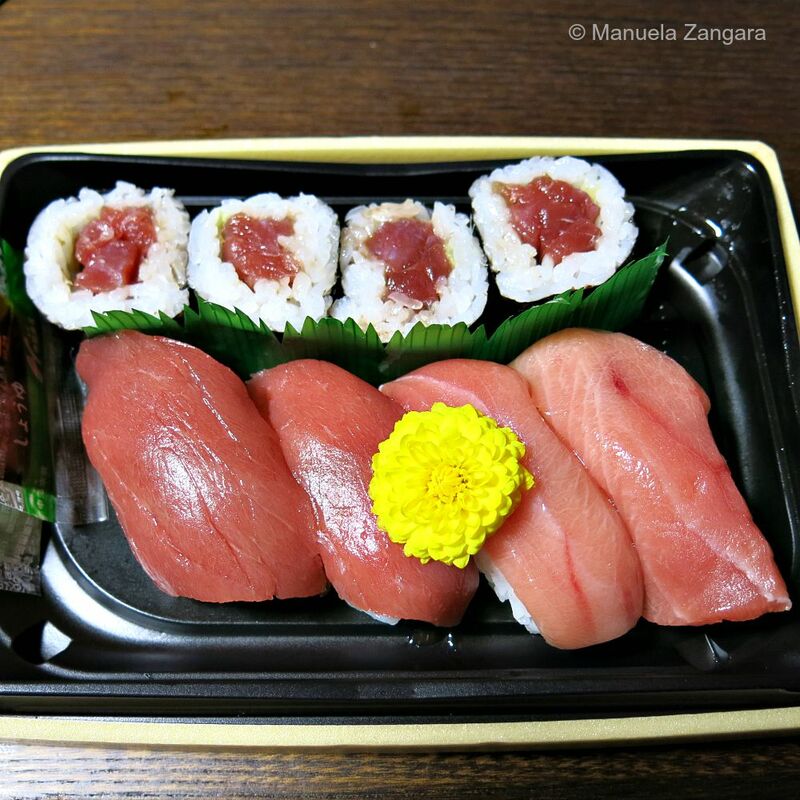 There are many well preserved machiya houses many of which have been transformed into restaurants, serving Kyoto style kaiseki ryori (Japanese haute cuisine) and other types of local and international food. Here you can also find some of the most exclusive and expensive restaurants, where guests are entertained by maiko and geisha. This is also the street where you can easily spot geishas. The best time to actually see real geishas is at about 6PM, when they get out of their houses to go to work. We saw many of them. All beautifully dressed and with amazing make-up. Try and be respectful though… we have seen tourists mobbing them and it did feel a bit like a human safari. I will write a separate post on Geishas and our experiences. 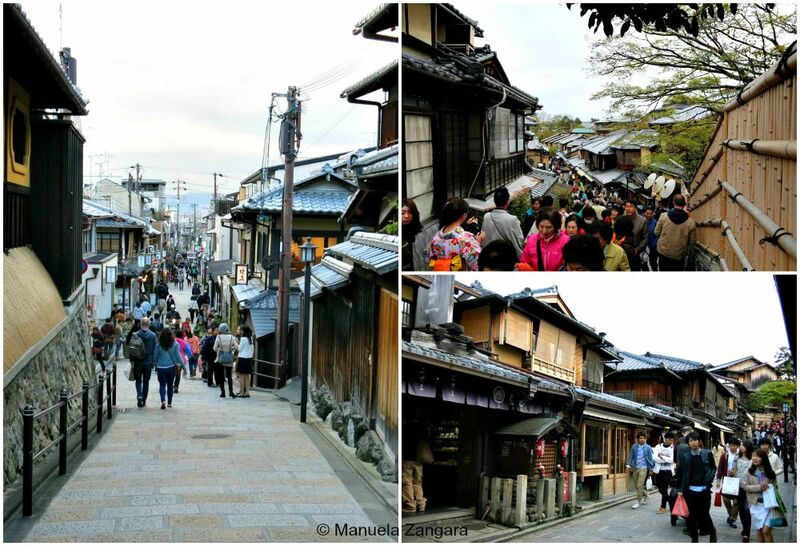 One of the most beautiful streets in Kyoto is definitely Shirakawa minami dori. 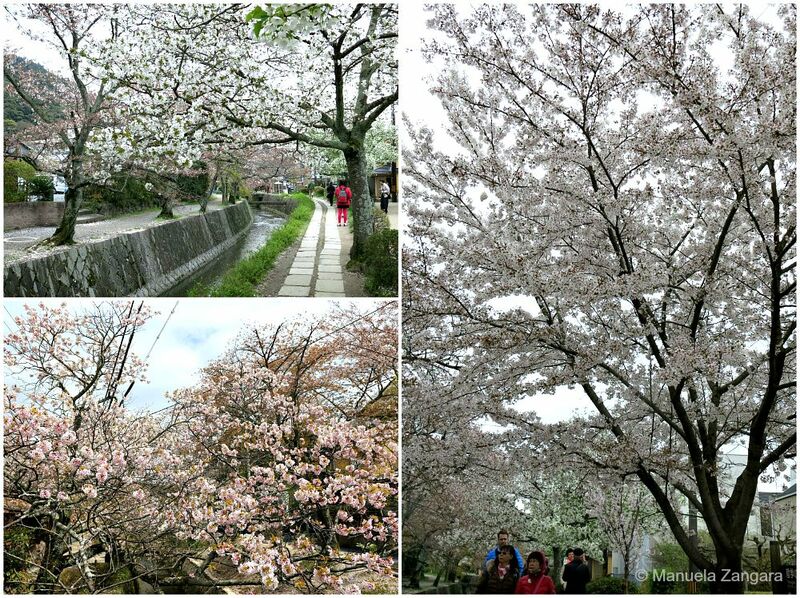 We were there in April, the cherry blossom season, so it was a fantastic sight. 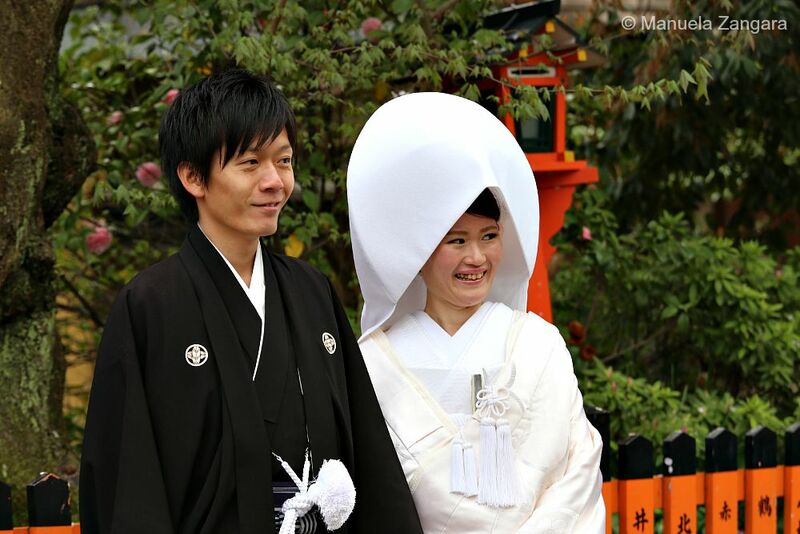 It is also a time when many Japanese people tie the knot. We were lucky enough to see quite a few just married couples taking their wedding photos in this area. Look at the beautiful clothes and hair-do’s they had! 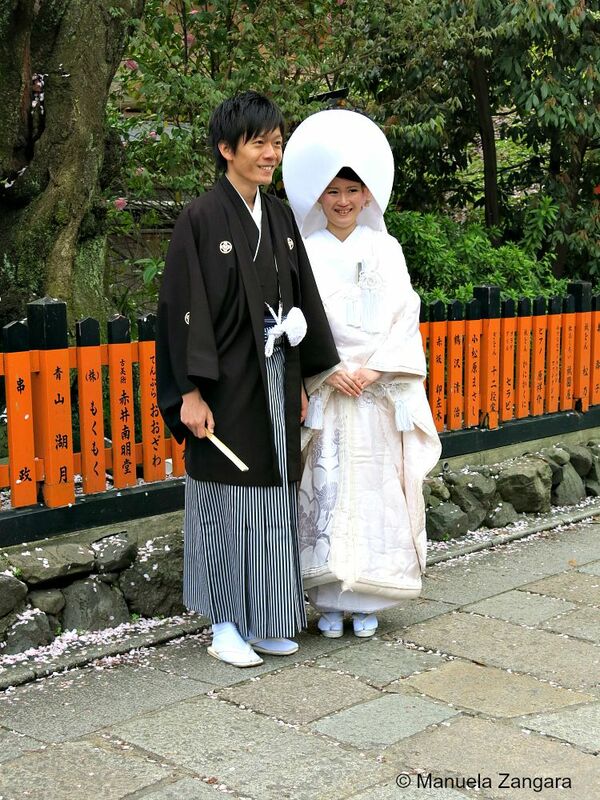 Spring is also the time when young people get dressed up in traditional clothes and get out to have their pictures taken in front of the sakura trees. 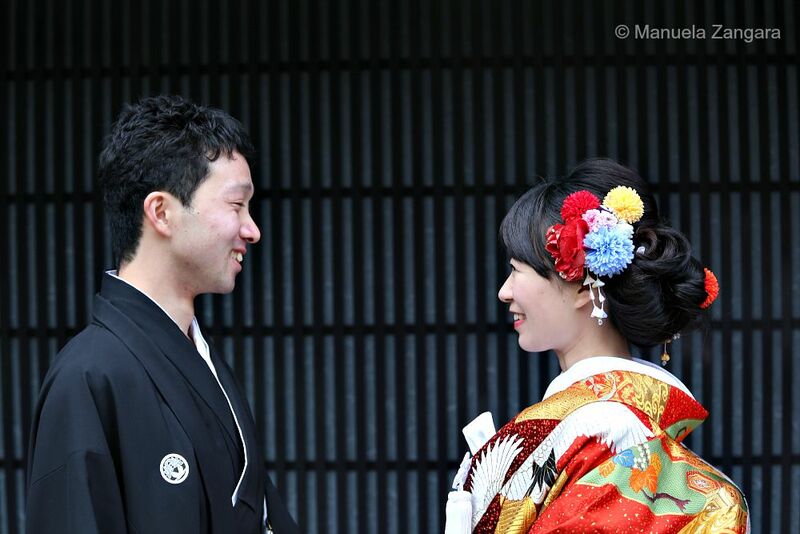 Many of these young people don’t actually own a kimono/yukata, but they rent them for the occasion. We got to see quite a few girls dressed in beautiful kimonos and our girls were in awe of them (so much so that we had to buy them a kimono!). Ninenzaka (where “our” house was) and Sannenzaka are amazing too! These little streets are lined with beautifully restored traditional houses. These lanes make for some of the most atmospheric strolling in the whole city and they make you feel like you are back in ancient Kyoto. (Scroll down to the “Accommodation” part of this post for more photos of this area). Ginkakuji – the silver pavilion – is beautiful. But its garden is even more impressive. I particularly loved the moss garden area and the dry sand garden. It was packed with students!!! 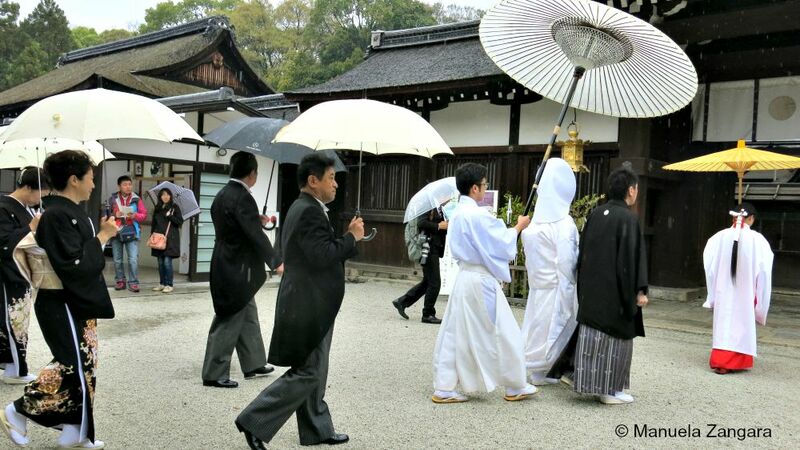 While strolling through the Philosopher’s Path in Northern Higashiyama, we visited Honen-in Temple. I really liked this little temple, tacked away on the side of the path. It has a little carp pond and a freshly raked sand garden. 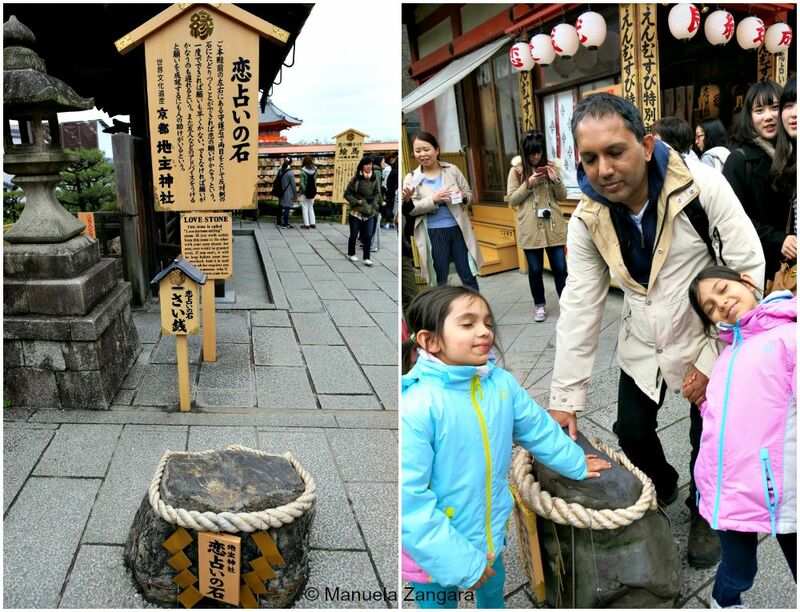 Continuing on the Philospher’s Path, we stopped at Nanzenji. I love the sakura rain! Thousands of petals fly around us, just like rain. 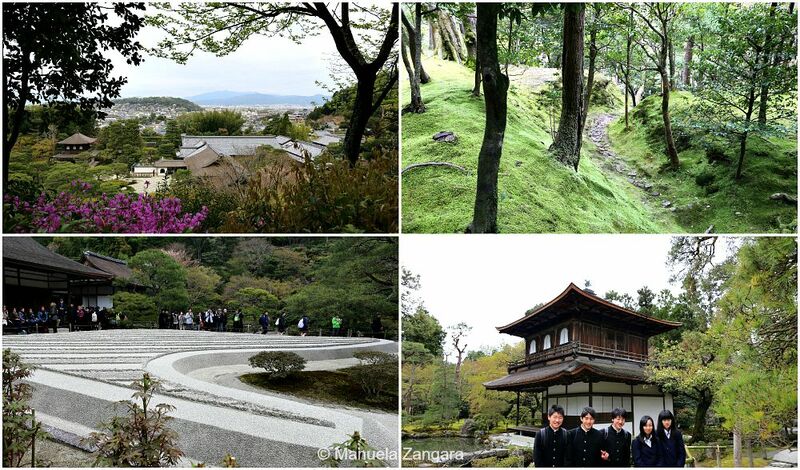 Nanzenji Temple is one of the most important Zen temples in all of Japan. It includes multiple sub-temples. To enter, you pass through the massive Sanmon gate. Then you see Nanzenji’s main hall called Hojo. Outside the Hojo there is a large brick aqueduct that passes through the temple grounds!! Apparently it is part of a canal system that was constructed to carry water and goods between Kyoto and nearby Lake Biwa. Nanzenin Temple is one of Nanzenji’s sub-temples. It is located just behind the aqueduct where Emperor Kameyama’s original retirement villa was, and it includes a mausoleum of the emperor, a temple hall and a garden with a pond. 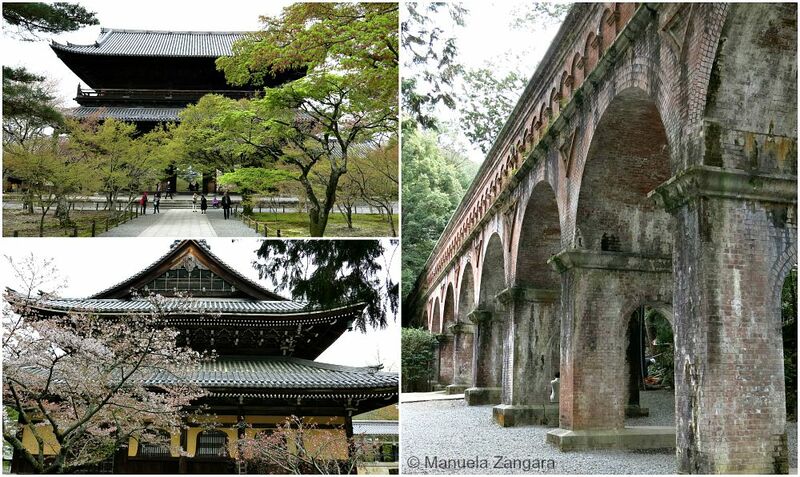 Other sub-temples include Konchi-in, Tenjuan (apparently a must see in autumn!) and my favourite… Okunoin. 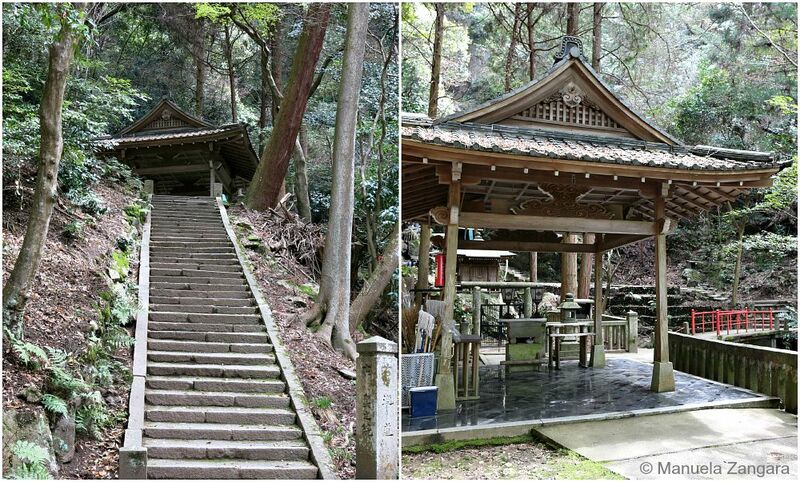 This is a tiny temple inside the forest that surrounds Nanzenji. You need to climb quite a few stairs to get to it, but it is so quiet and beautiful up there. On our way back, we met a group of students. Their teacher was making them RUN up and down the steep stairs for training. He told us it was good to make them stronger. This reminded me so much of Attack No. 1, one of my favourite anime series as a child… that I HAD to take a photo! Another one of my favourite areas is what is known as the “Philosopher’s Path” – Tetsugaku no michi. 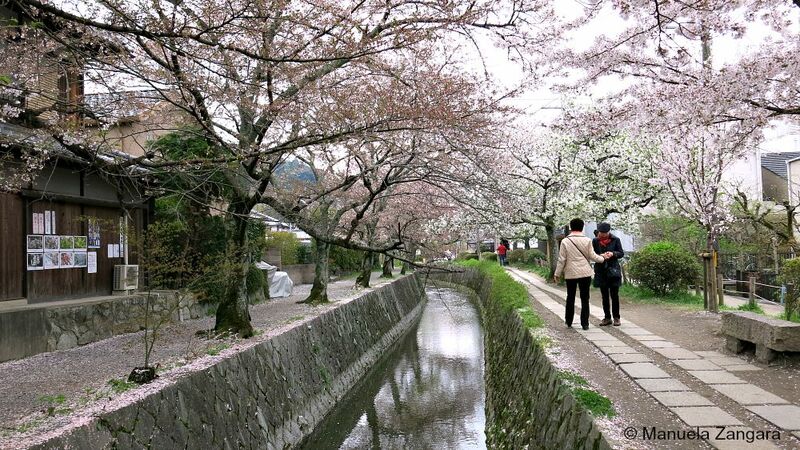 It is a pleasant stone path through the northern part of Kyoto’s Higashiyama district. 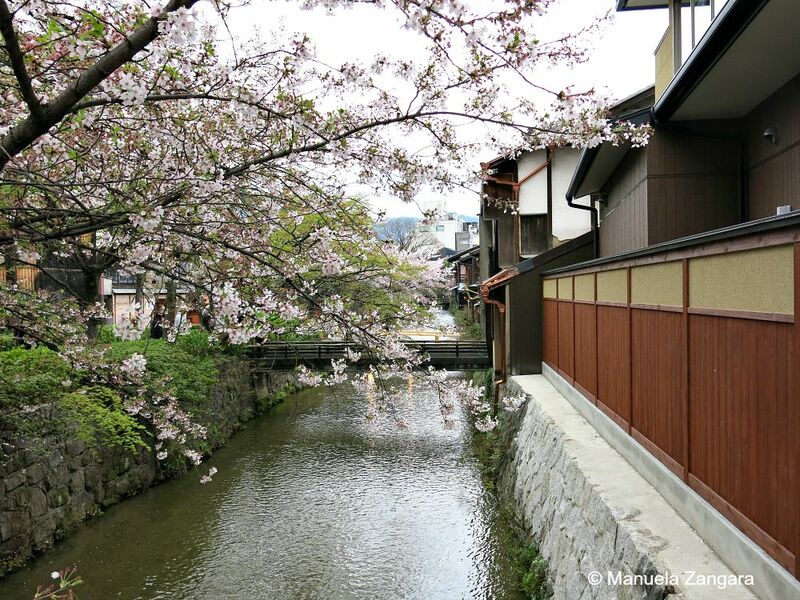 It follows a canal lined by hundreds of sakura trees, which make this one of the city’s most popular cherry blossom viewing spots. 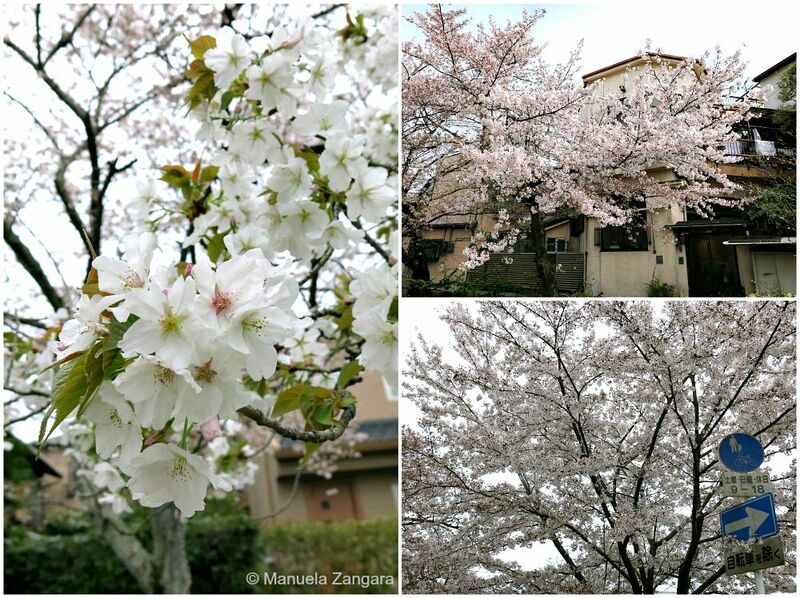 We were told that we missed the very high peak of the sakura by a week… but still, it looked pretty amazing to me! The Philosopher’s Path is about 2 kilometers long. It begins near Ginkakuji and it ends near Nanzenji. There are plenty of restaurants, cafes and boutiques in the area. There are also a few smaller temples and shrines a short walk from the canal. We visited Honen-in temple and loved it. 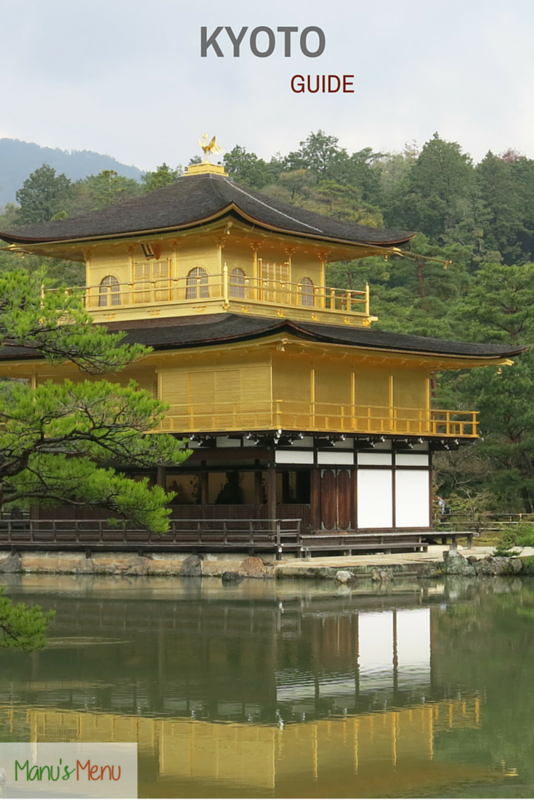 Kinkakuji – the golden pavilion – leaves you breathless. 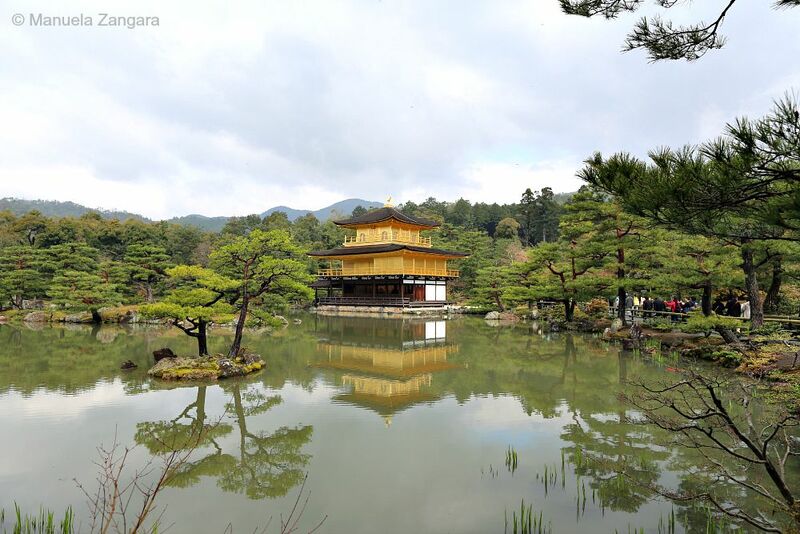 We were lucky to visit it during a sunny morning and the reflection of the golden temple in the pond was amazing. We arrived early and it was already packed with people, but the area in front of the pond is big enough to be able to take decent uncrowded pictures. The second 2 floors of the temple are covered in gold leaf and you can also see a golden phoenix at the very top of the roof. 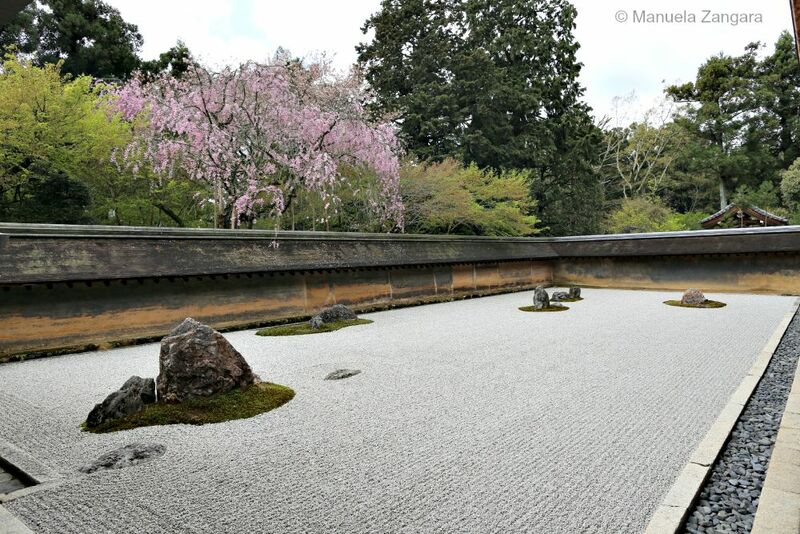 Ryoanji Temple (a Zen temple) is the site of Japan’s most famous rock garden. Try and arrive early as it is often packed! The garden consists of a rectangular plot of pebbles surrounded by low walls, with 15 rocks laid out in small groups on patches of moss. An interesting feature of the garden’s design is that from any point at least one of the rocks is always hidden from the viewer. The meaning is uncertain (some believe that it represents the theme of a tiger carrying cubs across a pond or of islands in the sea, while others claim that the garden represents an abstract concept like infinity). Ryoanji’s temple grounds also include a big park area with a pond. Arashiyama is a pleasant district in the northwestern outskirts of Kyoto. The Togetsukyo Bridge is Arashiyama’s well known, central landmark. 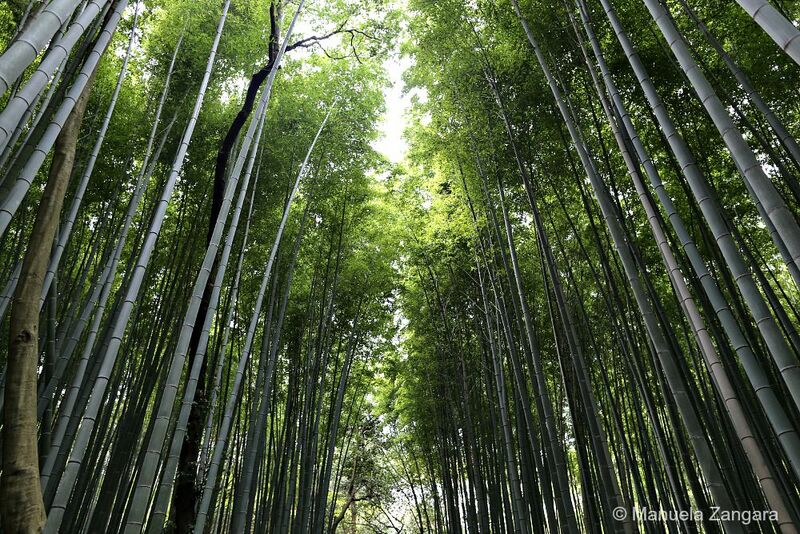 Many attractions are found nearby, including Tenryuji Temple and Arashiyama’s famous bamboo groves. 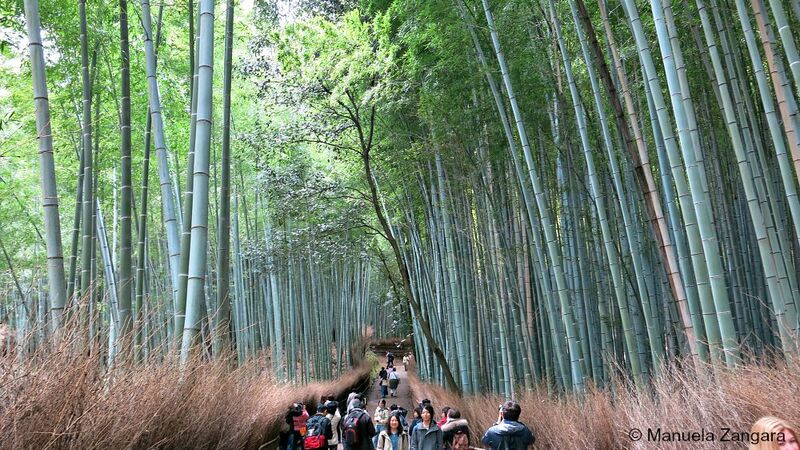 The walking paths that cut through the Bamboo Groves make for a nice walk, but they are packed with people! There are many other attractions in Arashiyama, like Okochi Sanso Villa, the Monkey Park Iwatayama and Tenryuji Temple which has a beautiful garden. We also visited the Shimogamo Jinja, one of the Kamo Shrines (the other being Kamogamo Jinja). These shrines were dedicated to the city’s protection and prosperity. 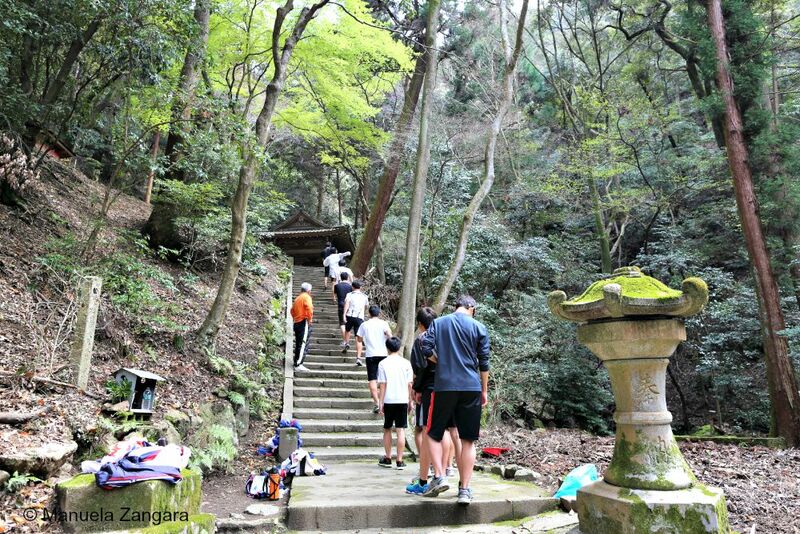 Shimogamo Shrine is surrounded by a forest that contains trees that are up to 600 years old. We managed to also see a wedding in there! 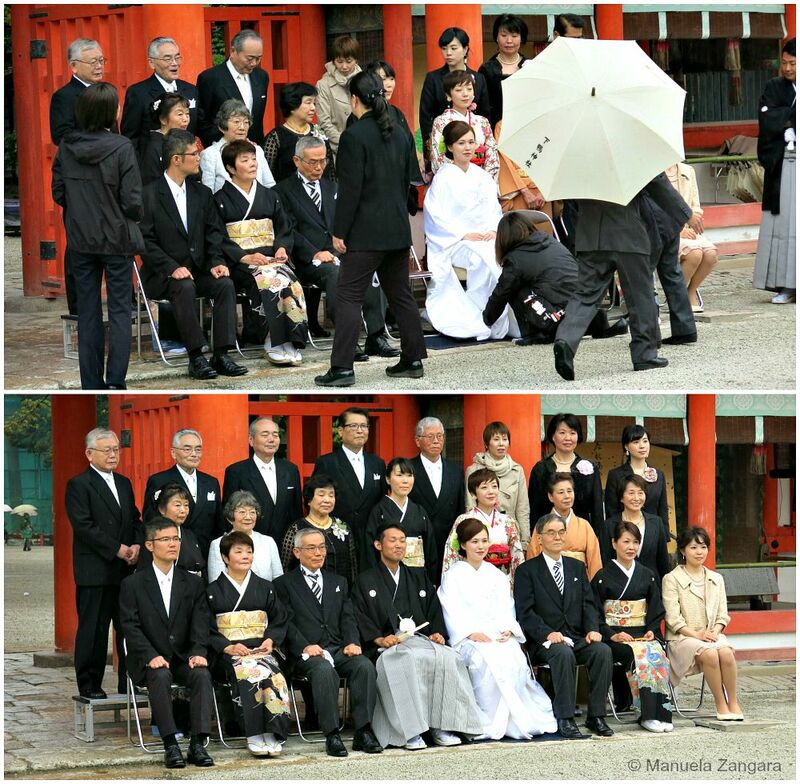 It was very interesting to see how the family portrait is taken. Getting everyone to look perfect takes a long time! But it was beautiful! Having a bit more time in Kyoto than in any other city during our holiday, we decided it would be the best place to do some shopping. 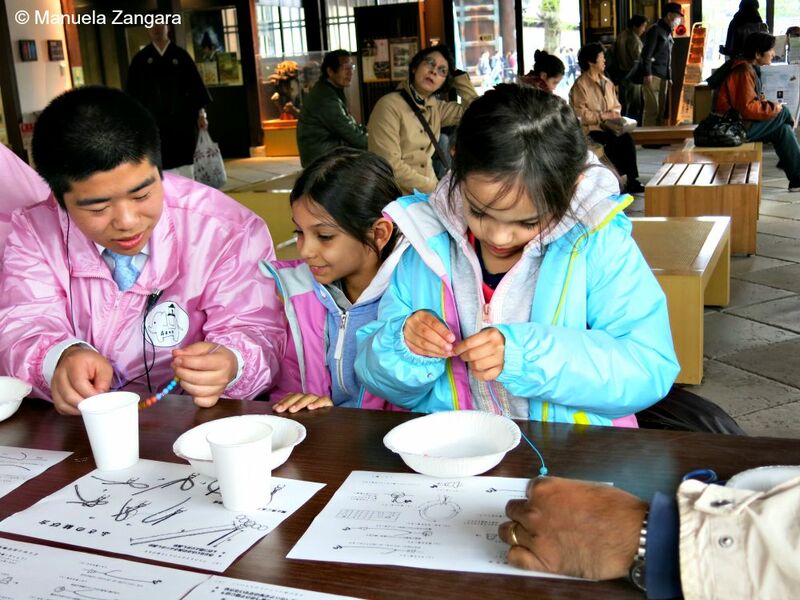 There are many places where you can get souvenirs from, but we did most of our shopping at the Kyoto Handicraft Centre. We found it very convenient because they sell almost anything you can think of in one place. The quality of their goods is excellent and we bought kimonos, yukata, damascene necklaces, and a few things for the blog at reasonable prices. Remember to bring your passport so you can do your shopping “tax free”. 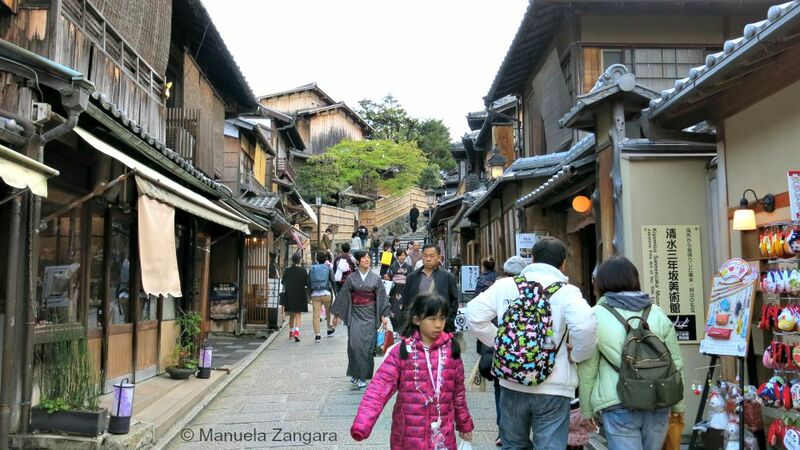 Other good areas to find local souvenirs are Ninenzaka and the streets around the Kiyomizu-dera. 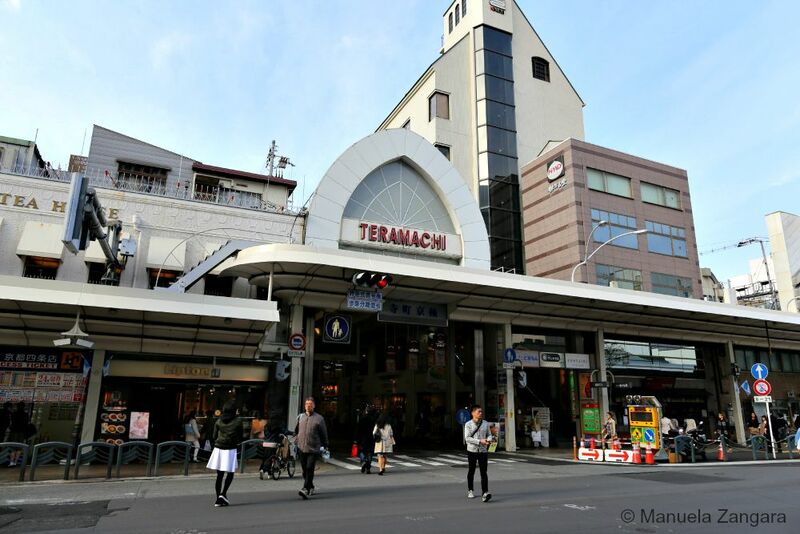 Teramachi Shopping Arcade is also a good area filled with nice little shops. And it’s covered, which is great on a rainy day! Besides visiting all the amazing temples and monuments the city has to offer, there are also some fun and less known activities to do in Kyoto. 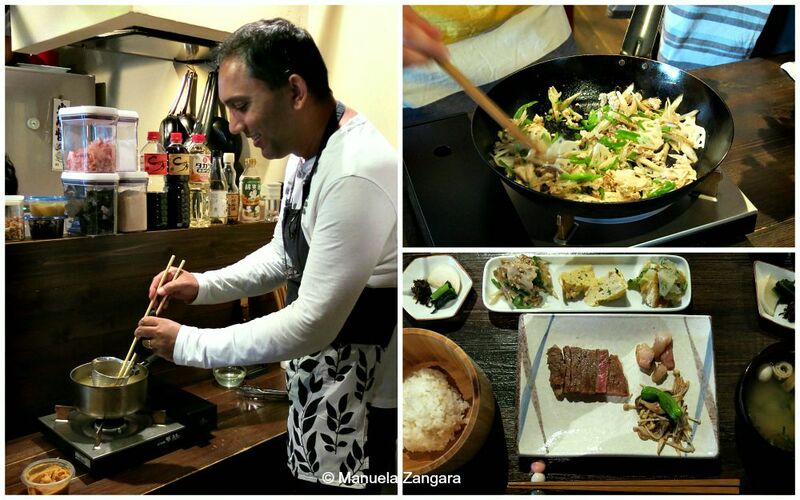 We spent one afternoon doing a wonderful cooking class – Haru Cooking Class. It was an amazing experience and we really enjoyed it. So much so, that I thought I will write a separate post about it, so I can be more specific about why we liked it and what we cooked/ate! Many tourists also dress up as geisha. There are many studios that offer a geisha and maiko makeover experience. 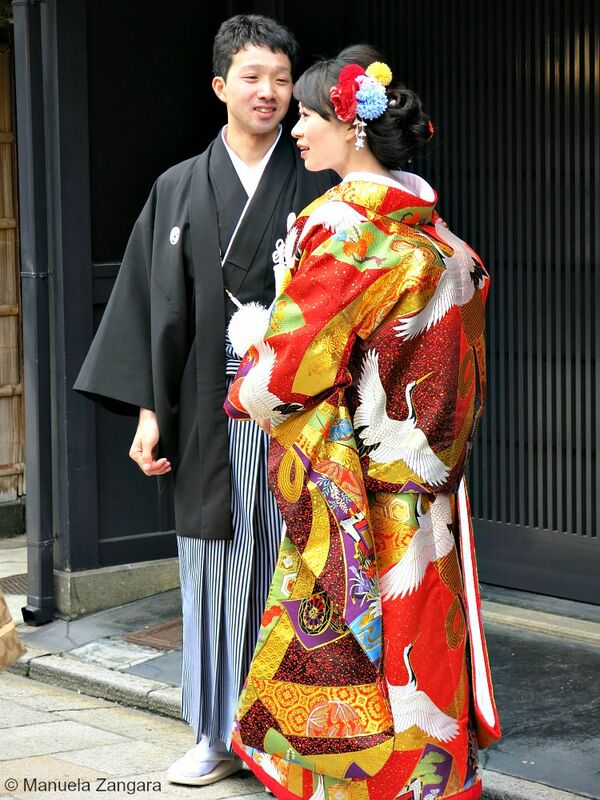 We had one just in front of our house, so we got to see quite a few geisha/tourists. Just google it and you will be amazed! 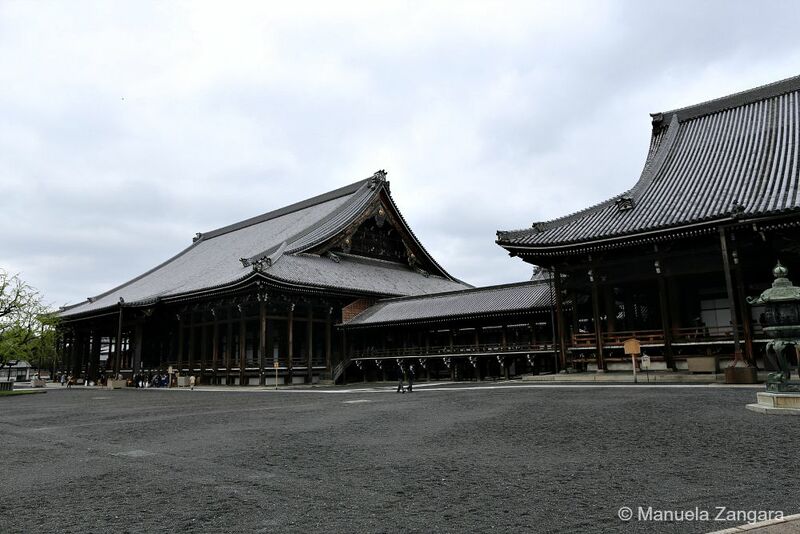 And then do not forget a day trip to Nara! 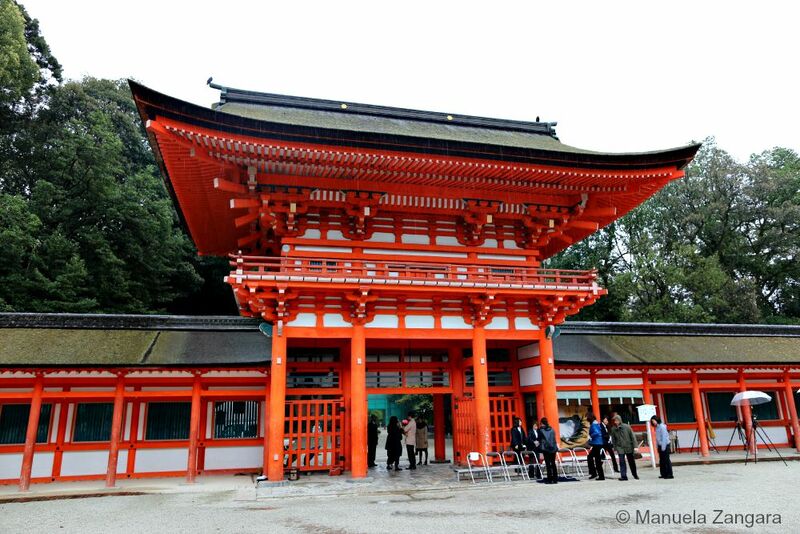 And pair it with Fushimi Inari… so worth it! Here is my guide. 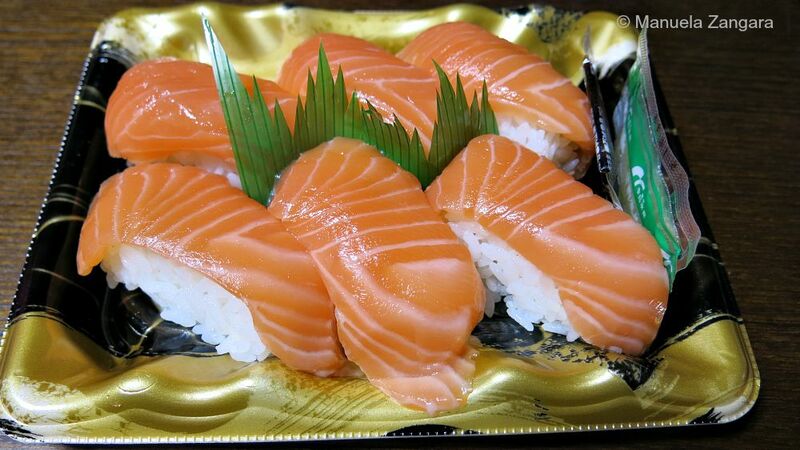 Food in Kyoto is a never ending experience. There are so many options, you almost get confused! 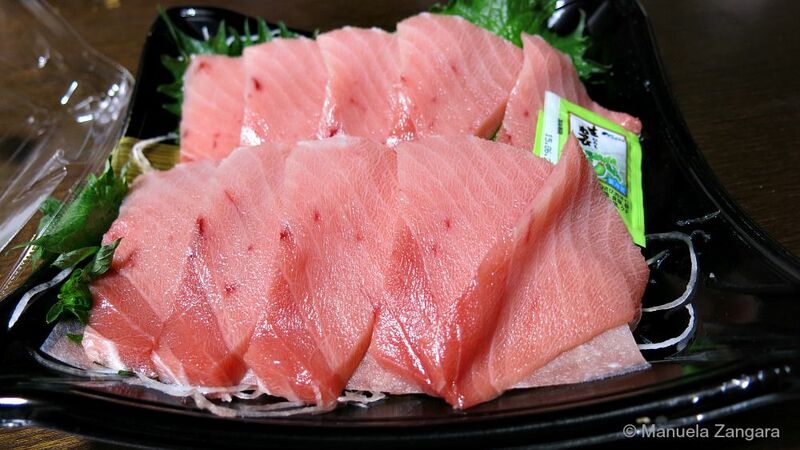 And the best part is… they are all delicious. 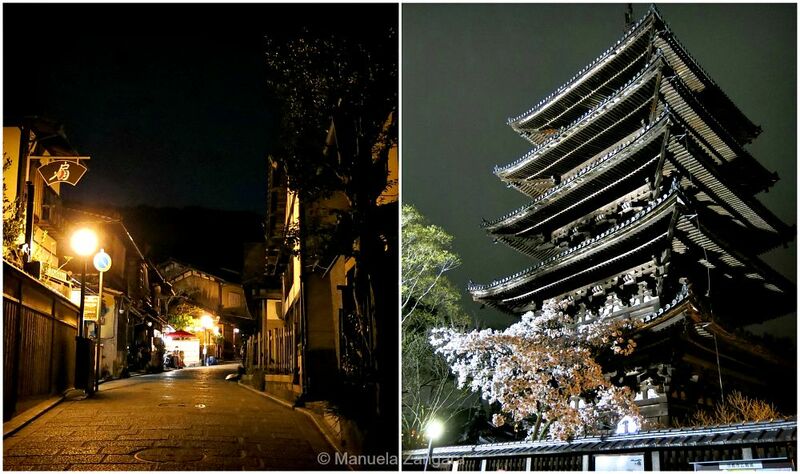 Pontocho is one of Kyoto’s most atmospheric dining areas. It is a narrow alley running from Shijo-dori to Sanjo-dori, one block west of the Kamogawa River. The alley is packed with restaurants on both sides offering a wide range of dining options from inexpensive yakitori to traditional and modern Kyoto cuisine, foreign cuisine and highly exclusive places. Even though the alley does look nice, we did not eat very well. We chose a place by chance and the food was scarce, expensive and not that great. We were rather disappointed by it. That happened on Day 1, so from the following day we changed our “food strategy”. 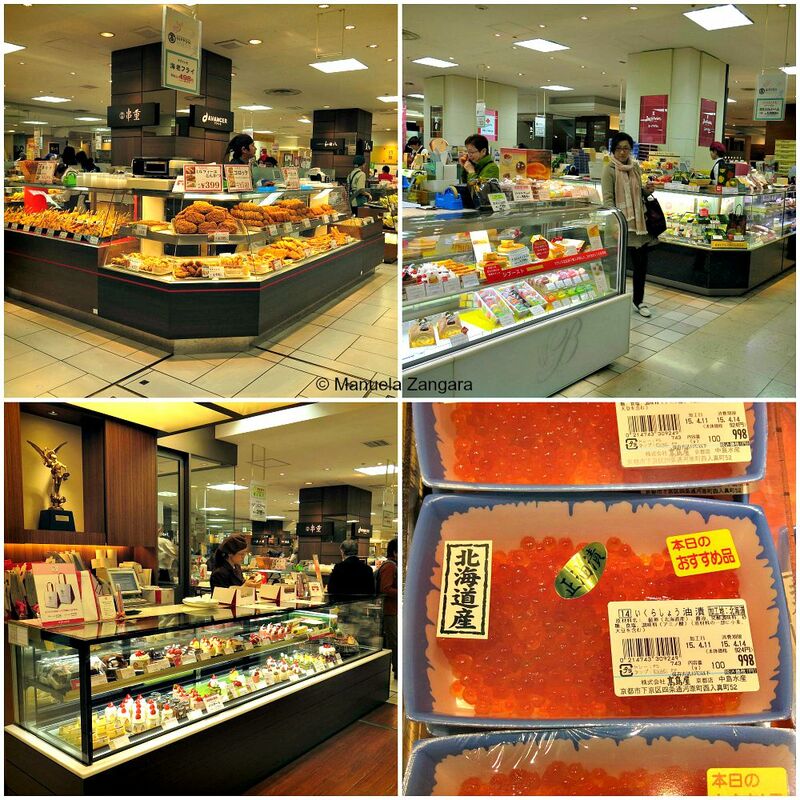 As we were lucky enough to have a little kitchen that included a fridge and a microwave, we decided to visit a depachika – the food floor of a large department store. 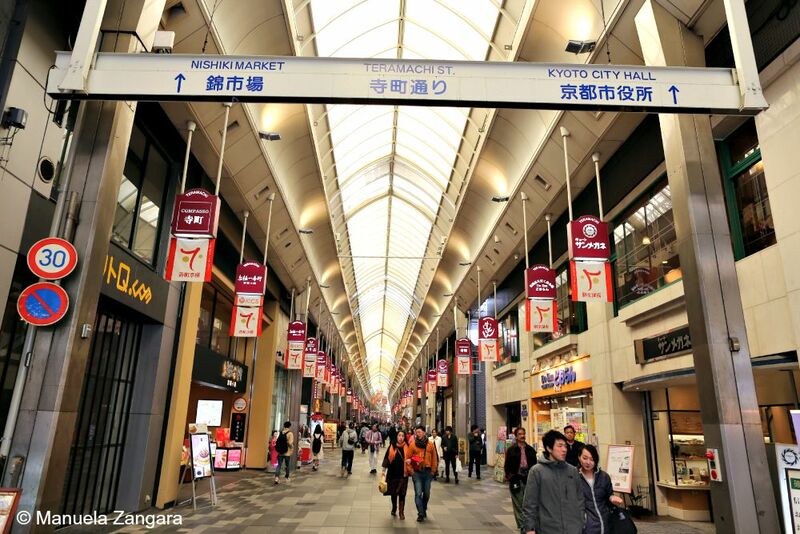 We chose Takashimaya on Shijo-dori/Kawaramachi. It was a revelation. 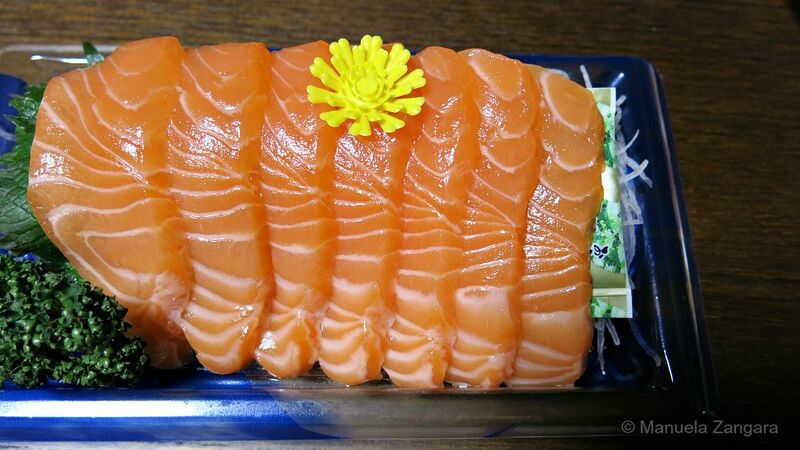 The food selection at depachikas is amazing… there is everything from delicatessen style items, to snacks and treats, to bento shops, to supermarkets, to great sushi and sashimi places. They even have foreign shops like the Italian Peck or French bakeries like Fauchon! I had heard about these places before leaving, but I was literally blown away by the quality and variety of food sold here. 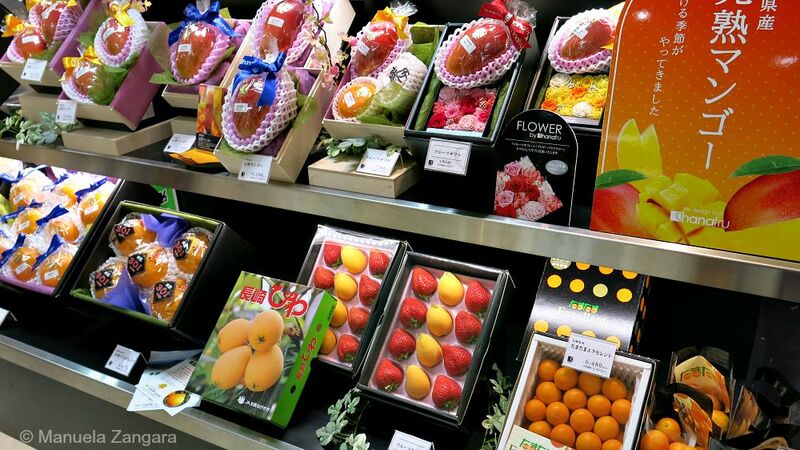 And look at this fruit shop… the fruit looked so pretty and nicely packaged! If you are on a budget, try to get there at around 7 or 7:30PM. That’s when the prices get discounted just before closing time. We had no idea and found out by chance. From Day 2 and for all our stay in Kyoto, we bought our dinners and next day breakfasts (and sometimes even our lunches) at a depachika. 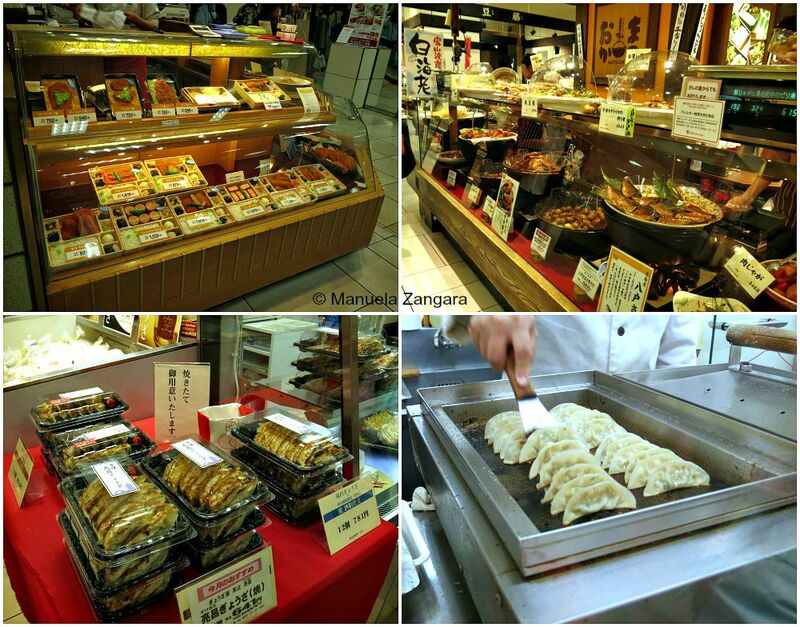 Our favourite one was Takashimaya, but the Isetan at Kyoto Station was good too. 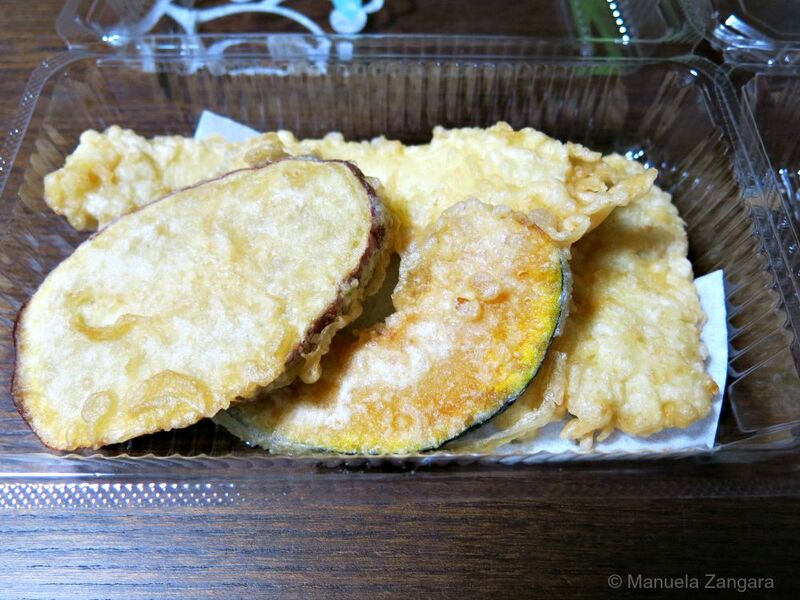 We ended up spending less than half what we had spent in Pontocho and ate better quality and tastier food. 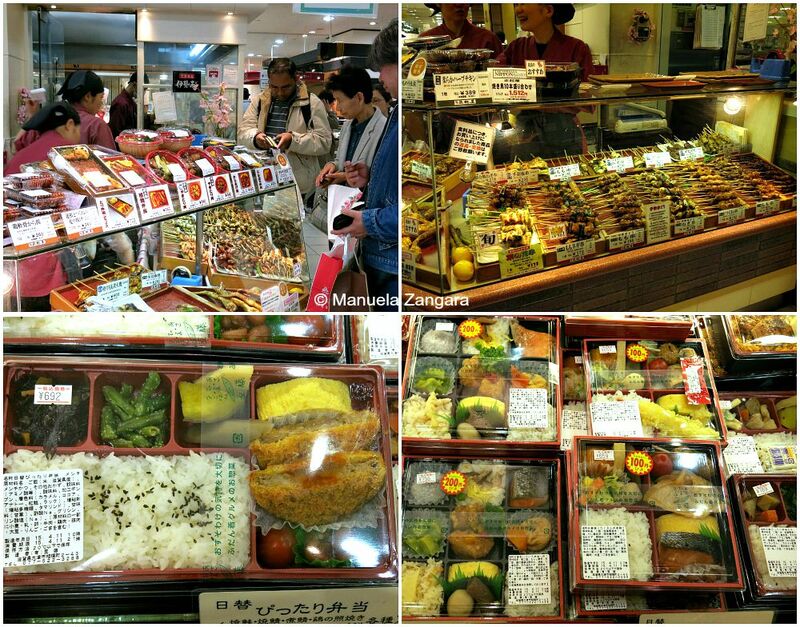 Besides, you can buy different items at different stalls and enjoy many specialties in one meal. Highly recommended. 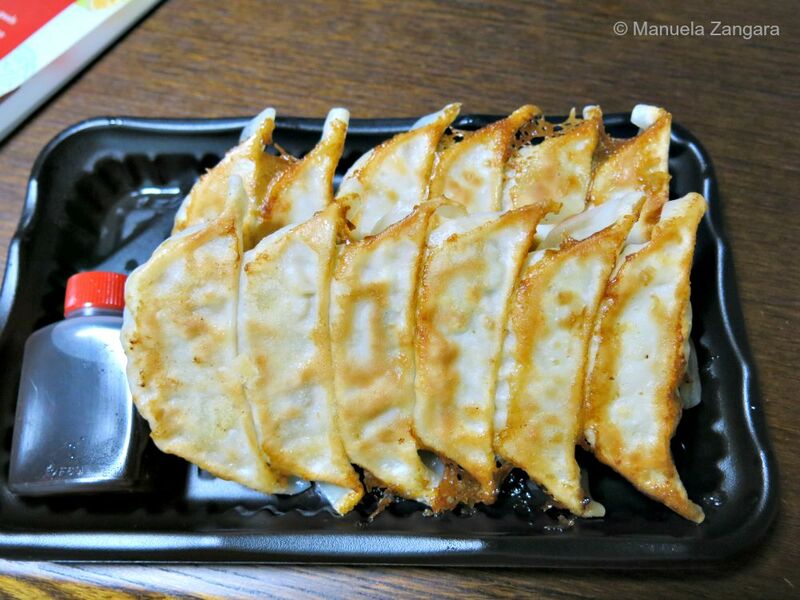 In many stalls, you can also get to see how the food is cooked… like these gyoza! If you have a sweet tooth, a visit to one of the Malebranche shops is a must. There is one near the Kiyomizu-dera (on Matsubara-dori) and one at the Isetan of the JR Station. 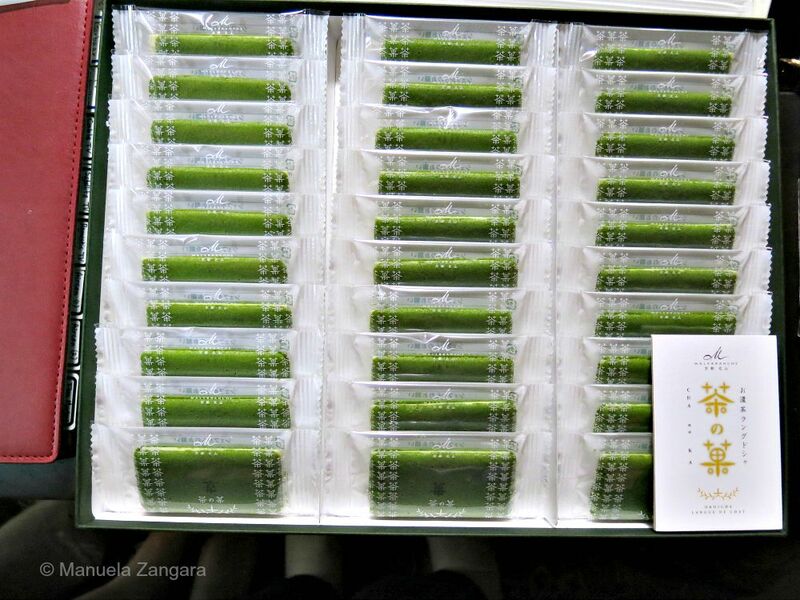 They sell amazing sweets… and their matcha Cha no ka (茶の果). They are green tea langue de chat cookies filled with white chocolate. They are AMAZING. 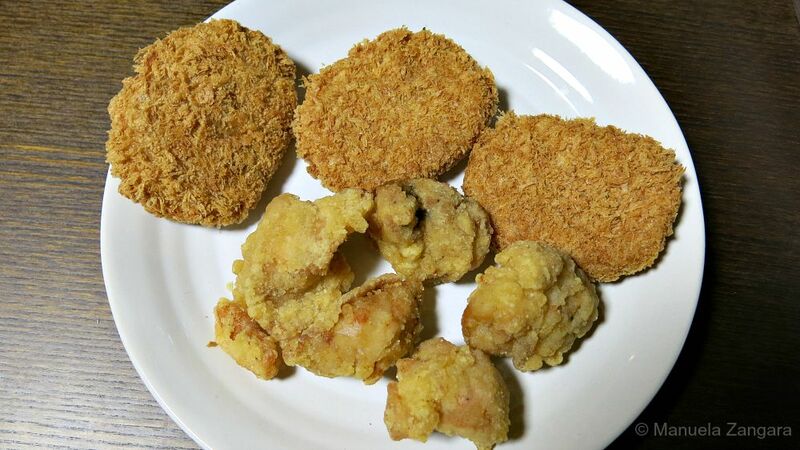 Around Matsubara-dori, you will also find small shops that sell delicacies like fish cakes and steamed buns. These are not “regular” steamed buns… they are filled with Kyoto beef and they are so good! They are especially comforting on a cold rainy day… believe me. On Ninenzaka, we found another sweet shop worth a visit. They sell some great plum jam and liqueur. I do not know the name of it, but it is on Ninenzaka, on the left hand side going towards the Kodaiji Temple. Also, make sure to buy some local sake. 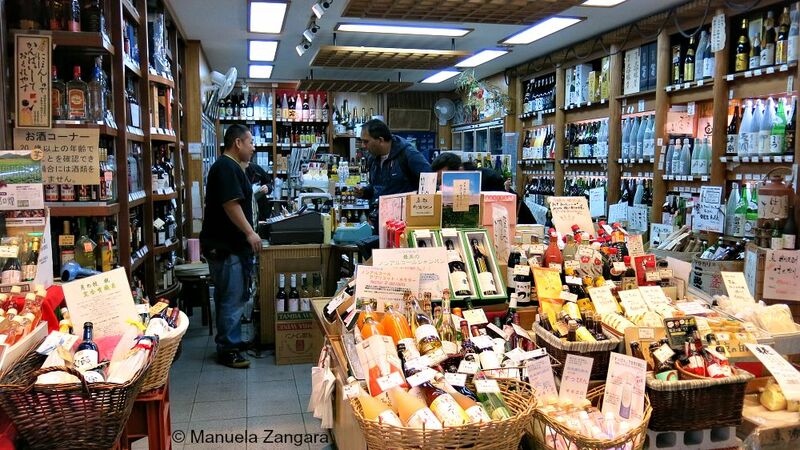 There are many liquor shops in Kyoto with plenty of choice! 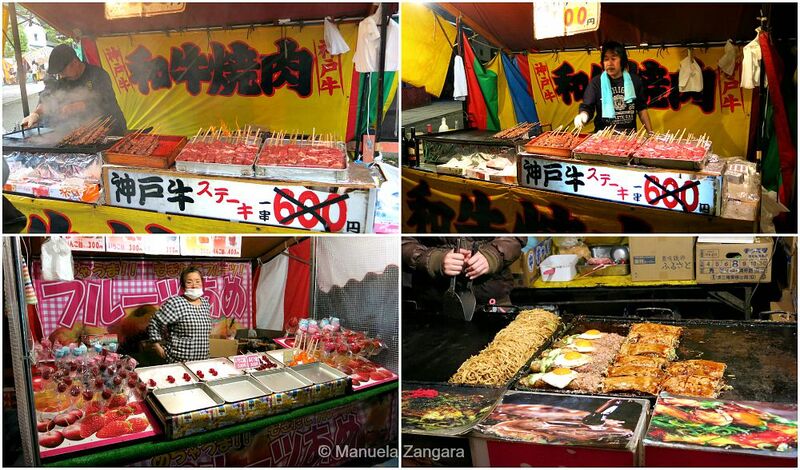 If you are into street food, you must try the food stalls at Yasaka Jinja and around the Maruyama Park. 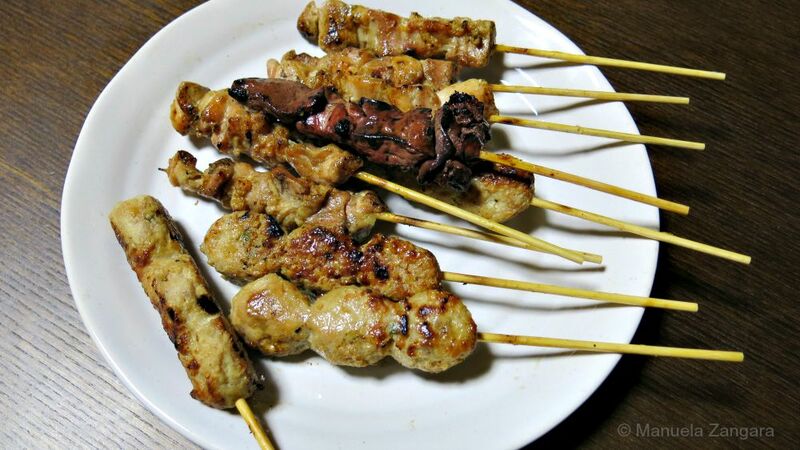 There are so many options… from yakitori (including Kyoto beef! 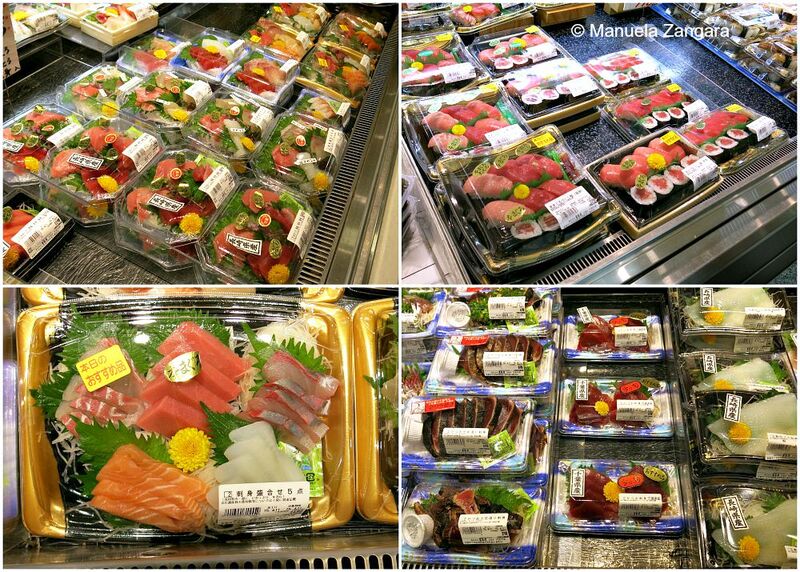 ), to candy fruits, to okonomiyaki etc. The smell in the air is inebriating. I loved this area in the evenings, all lit up. As mentioned, in Kyoto we rented a little machiya house: Kiyomizu Machiya Inn. The house is beautiful, inside and outside. It is a restored old tea house, full of character and charm. It’s in a fantastic spot. It’s basically in front of Ninenzaka, in the heart of Southern Higashiyama. But the best part is that it is also very quiet, as it is tucked in at the end of a tiny cobblestone lane where tourists don’t go. It is also very close to the Yasaka Pagoda and barely a 5 minute walk from the bus stops (and convenience stores) on Higashi Oji dori. 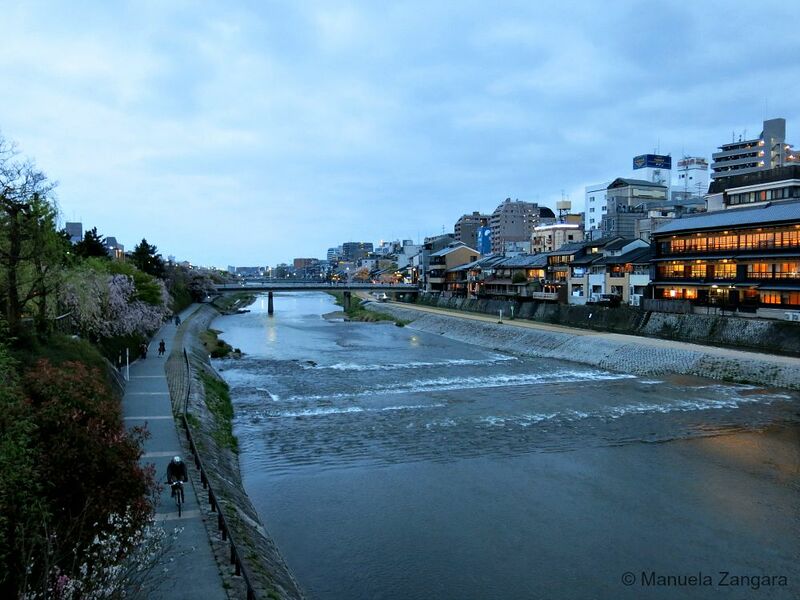 So you are in the centre of ancient Kyoto, yet very well connected to get anywhere you like! Besides, walking around Ninenzaka in the evening, after the crowds of tourists have left and with the streets all lit up is an experience that we’ll never forget. Before booking it, I was concerned that it would be a bit too “out of the way”, but after having being there I can say that it was the best place to stay at. The area was my absolute favourite in Kyoto… and Kyoto was my most favourite city in Japan… which makes this house PERFECT. It’s also very close to the information centre that also works as Takuhaibin… so receiving and sending your luggage is so easy! It is a 2 storey house. As in all Japanese houses, you have a little entrance with space to leave your shoes and then there was a little living room, a well equipped kitchen, a bathroom with a tub and shower and even a laundry (with a washing machine that also dried clothes)! 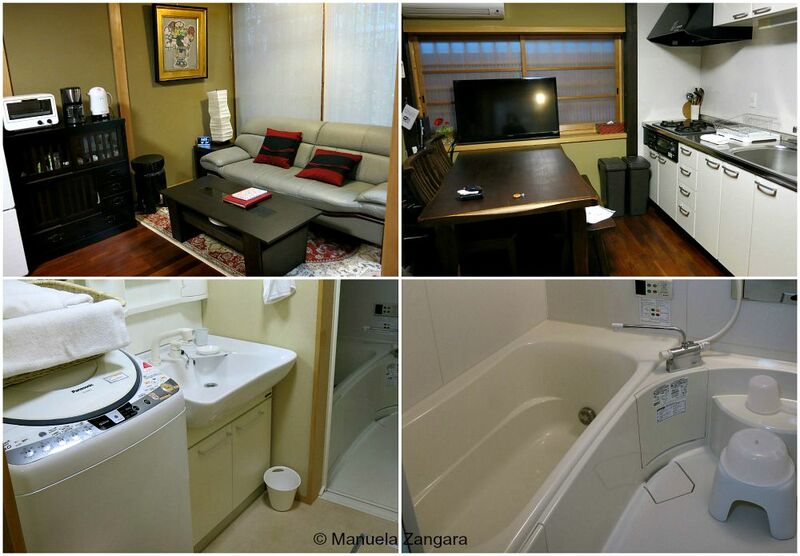 On the second floor, there are 2 bedrooms (1 Western style and 1 Japanese style) and a little study. Basically, everything you need and more. We had soaps (including soap for the laundry and dishes), tea, sugar, plates, glasses, cups, etc… all the basics. Needless to say everything was absolutely clean! There was a heater/air con and we simply loved to have a place to call home for a few nights. Booking was very easy. I sent an email directly to the management, but you can also check Booking.com or HotelsCombined to see if they have any better prices. The people who manage the house are very well organised and helpful and they speak very good English too, which is a plus. I highly recommend the Kiyomizu Machiya Inn because living like the locals for a few days helps to you to better appreciate a place. Besides, the location is unbeatable. This is definitely the place where we will be staying on our next visit to Kyoto, and we can’t wait. We found that the best way to get around Kyoto is by bus (or on foot) as the bus network connects most major sights in the city. The tourist offices provide a useful English network map for the Kyoto City Buses, which makes it quite easy for foreign visitors to access tourist attractions by bus. We also had maps provided in our house. We had heard that buses tend to be slow, but we never had a problem. They can get quite crowded in peak hours, but not more than in any other big city around the world. Buses are entered through the back door and left through the front door. The fare has to be paid when leaving the bus. There are two subway lines in Kyoto, the Karasuma Line which runs from south to north along Karasuma-dori and stops at JR Kyoto Station, and the Tozai Line which runs from east to west and crosses the Karasuma Line at the intersection of Karasuma-dori and Oike-dori. But we never used the subway. 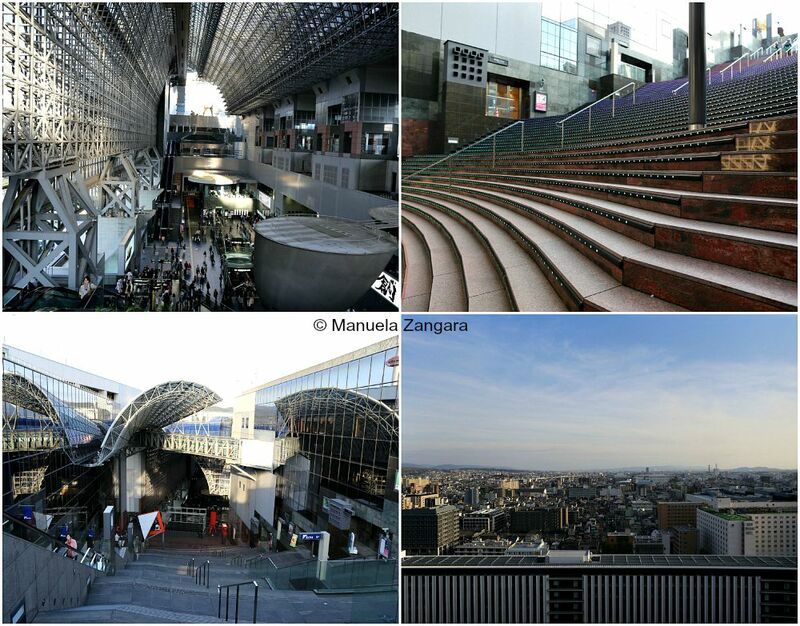 All JR lines including the Tokaido Shinkansen pass through or commence at JR Kyoto Station. JR trains are a good option for accessing the Arashiyama area (Sagano Line) and some attractions in southern Kyoto along the JR Nara Line, like Fushimi Inari. 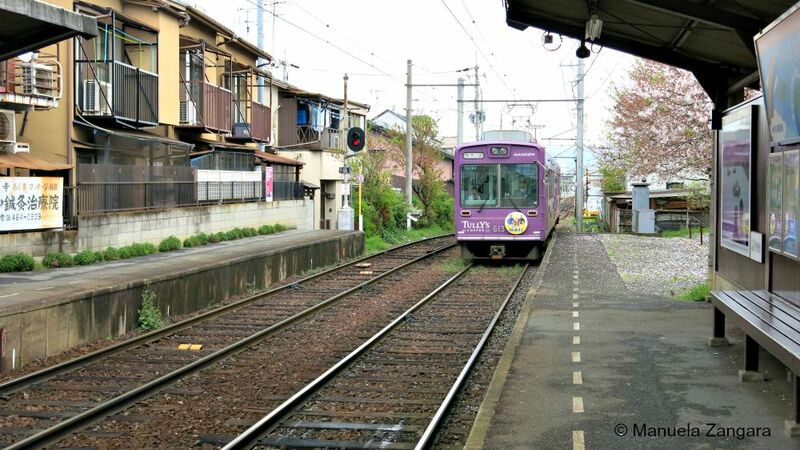 Keifuku Railways (also known as Randen) operates two tram like train lines in northwestern Kyoto. For train lovers, a ride on these trains is a small attraction by itself, both because the cars are really nice and for the beautiful panorama that you get to see, especially around the Ryoanji. We used these lines to access Arashiyama and the area around Ryoanji and Kinkakuji. The Keifuku Railway lines are not covered by the daily bus pass. You can use a SUICA card to pay for the fare. You usually tap it when you arrive at your destination. Kyoto Sightseeing Card – (1,200 yen for one day, 2,000 yen for two days) – Unlimited use of Kyoto’s two subway lines and of Kyoto City Buses and Kyoto Buses in central Kyoto and outskirts, including Arashiyama, Takao and Ohara. Kyoto One Day Bus Card – (500 yen) – Unlimited use of Kyoto City Buses and Kyoto Buses in central Kyoto and Arashiyama on one calendar day. Unlike the Kyoto Sightseeing Card (see above), the one-day bus card does not cover other outlying areas such as Takao and Ohara. This is what we used. You validate it with the machine only the first time you ride the bus, to print the date on it and then you show it to the driver every time you get down the bus. Easy. Kyoto Subway One Day Card – (600 yen) – Unlimited use of Kyoto’s two subway lines on one calendar day. Prepaid cards like SUICA (or ICOCA) don’t give you any discounts, but they make the process of taking trains and buses easier, as you do not always need to buy a new ticket for each ride. You can easily reach Kyoto by Shinkansen. It takes about 1.5 hours both from Tokyo and from Hiroshima. Kyoto is also just a half hour away from Osaka. I am so desperate to return to Japan! 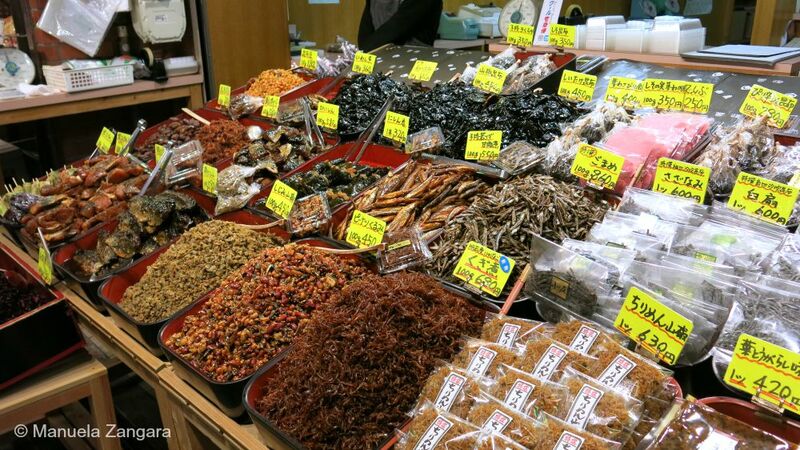 Last year we went to Tokyo and Kyoto but we just scratched the surface – so much to see. Your lovely photos brought back great memories. And the food!